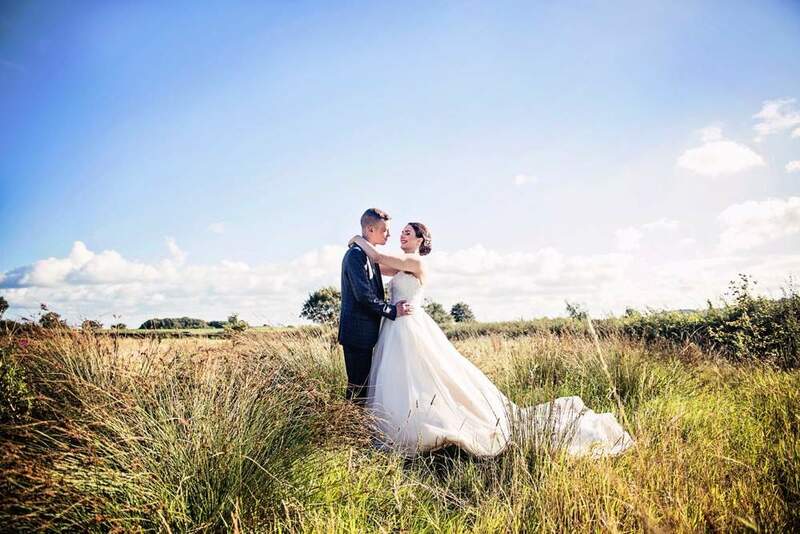 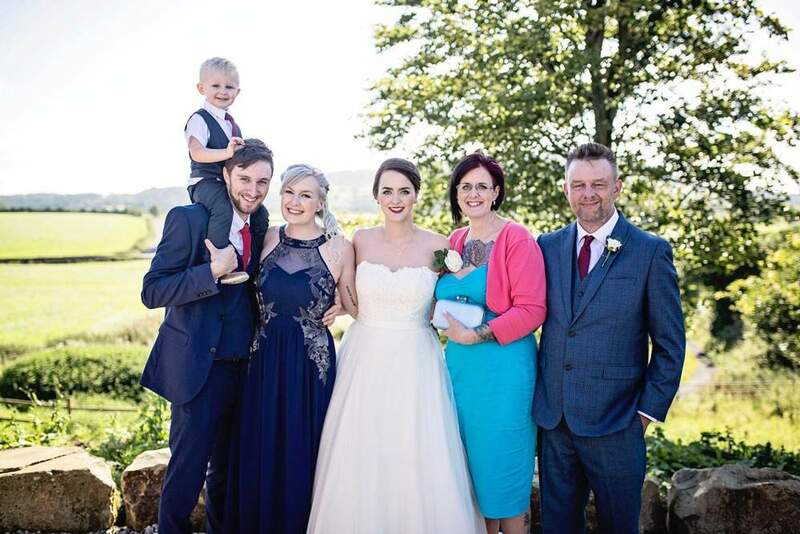 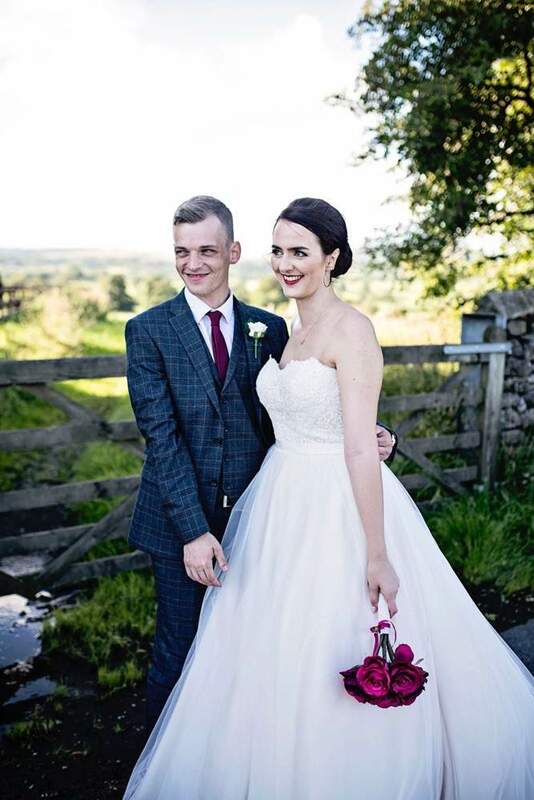 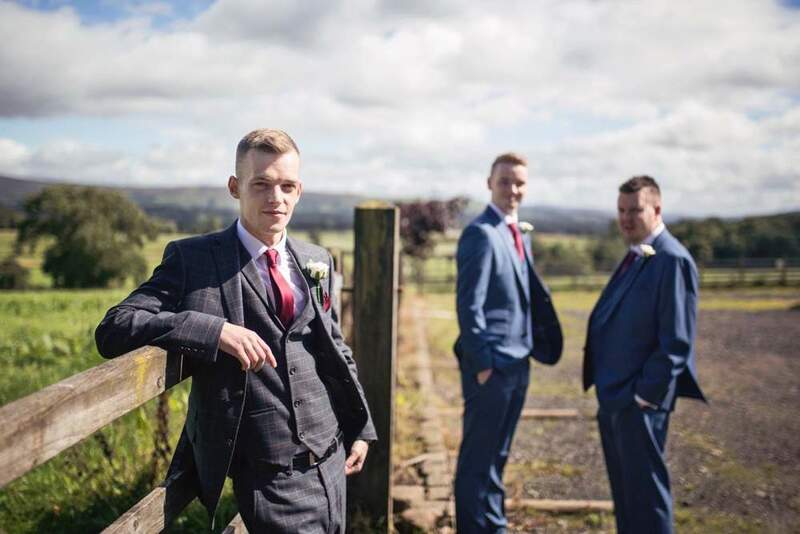 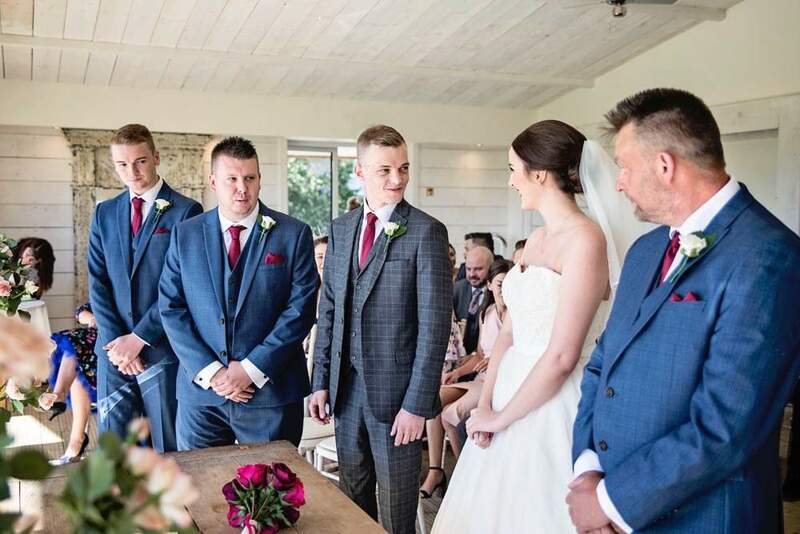 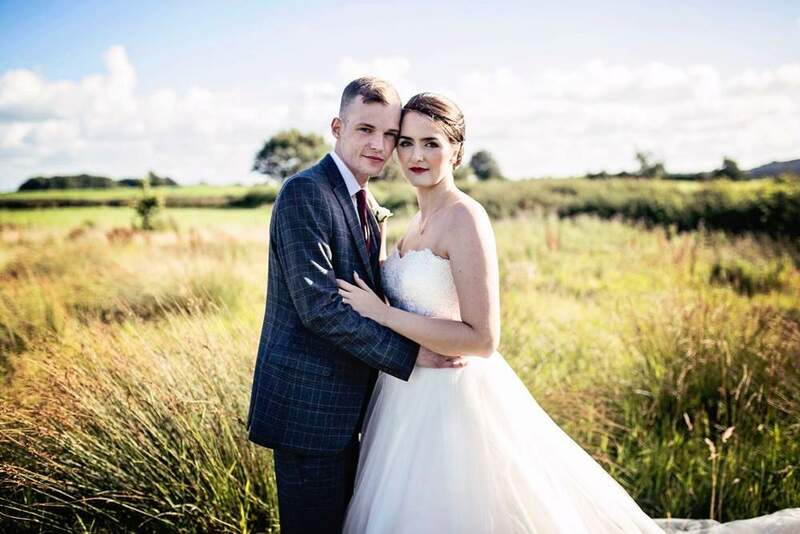 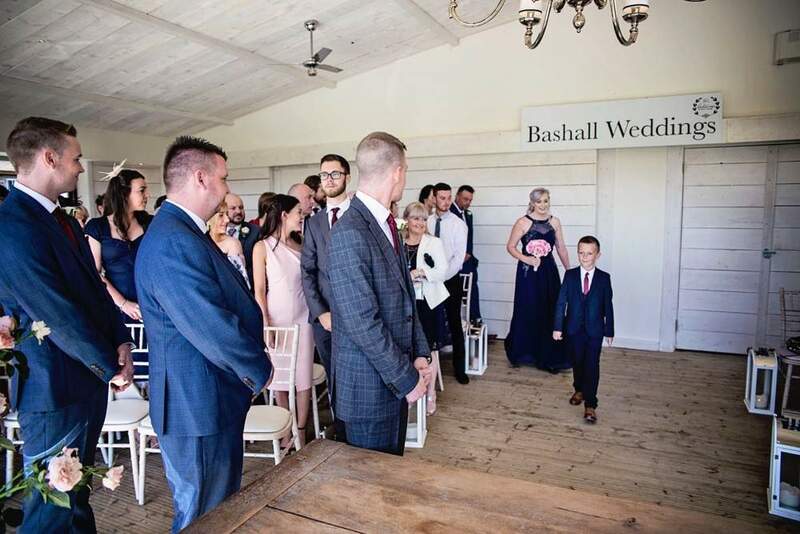 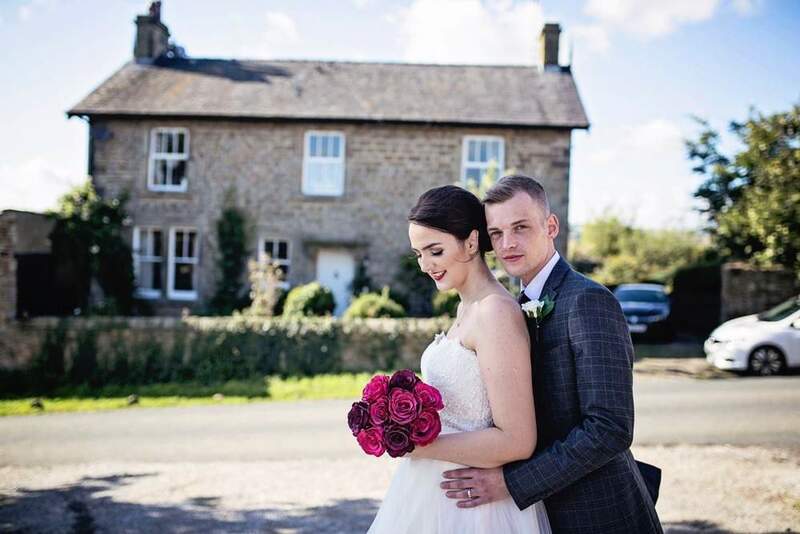 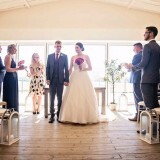 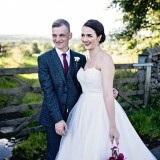 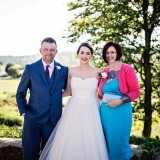 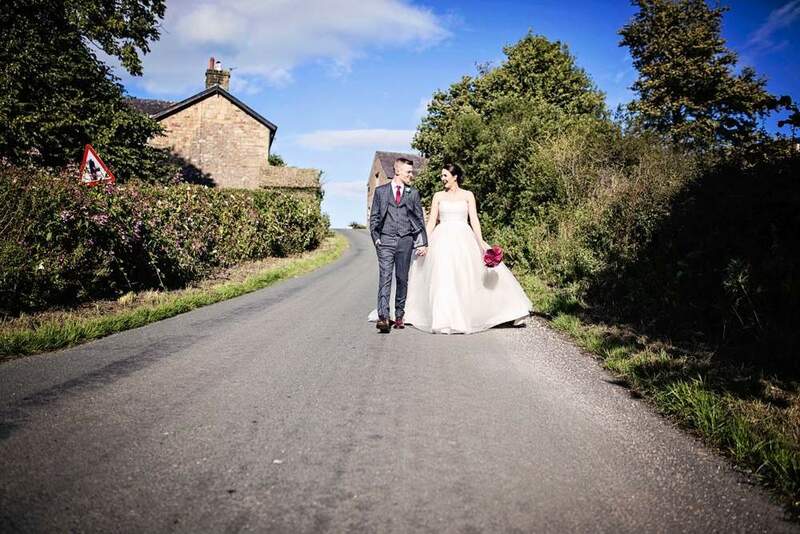 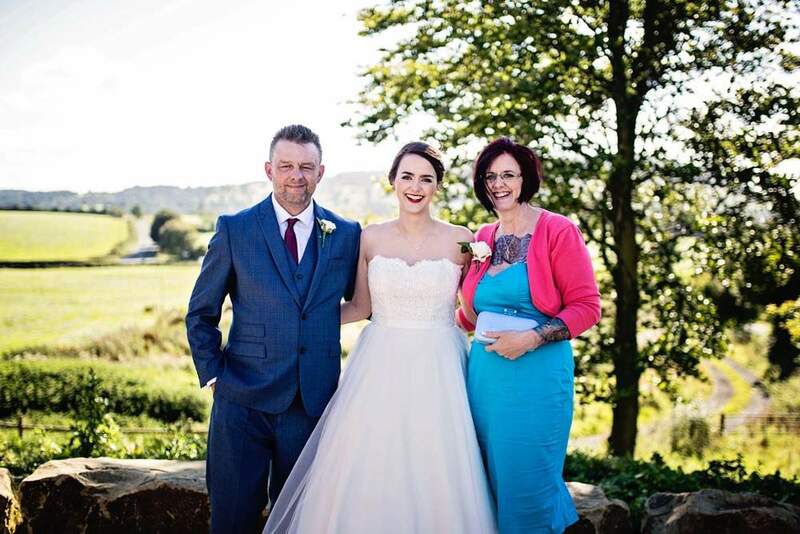 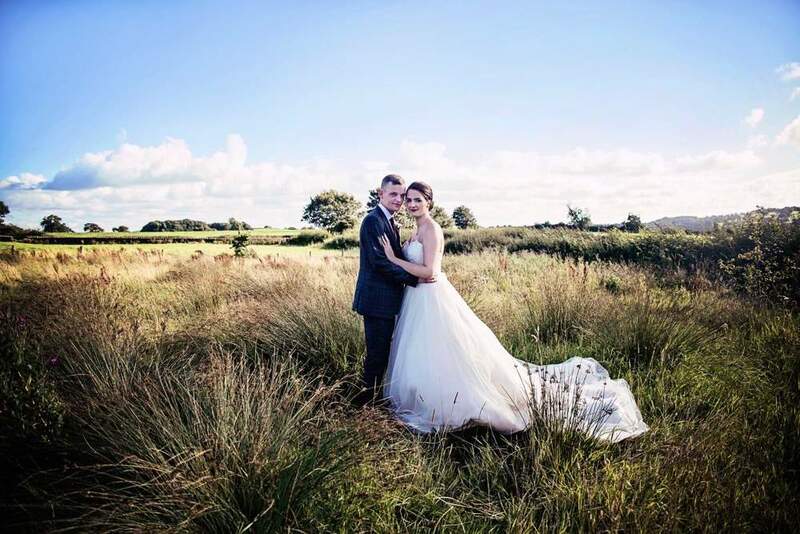 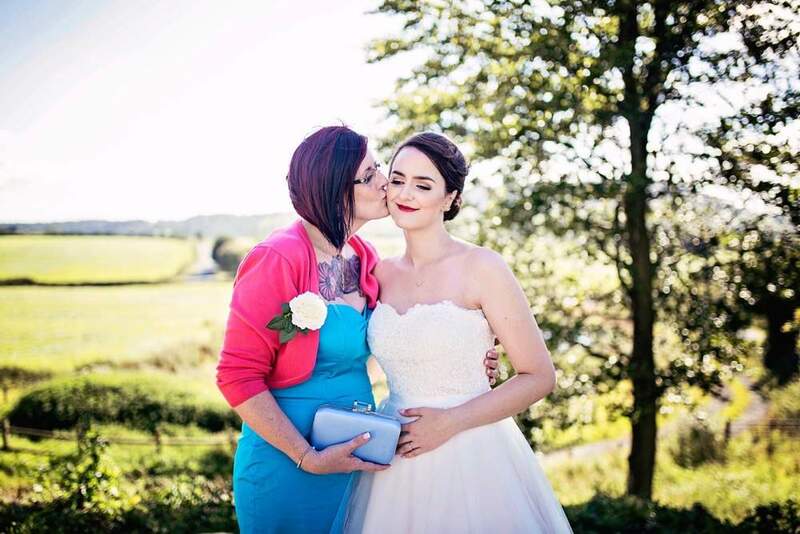 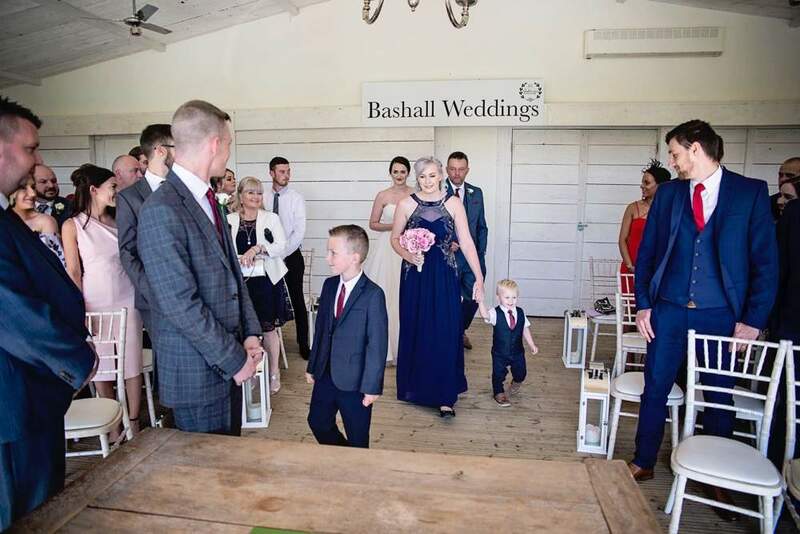 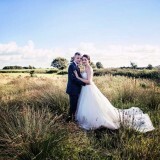 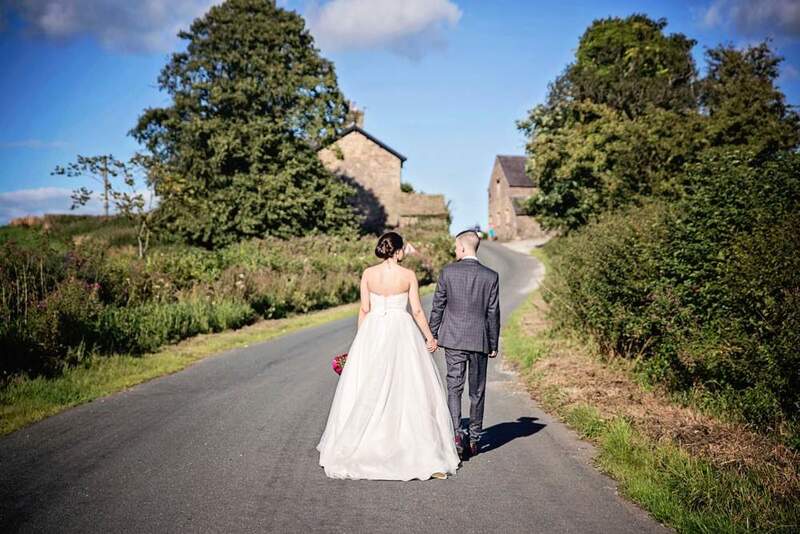 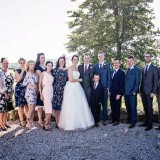 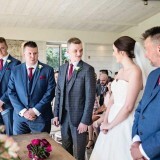 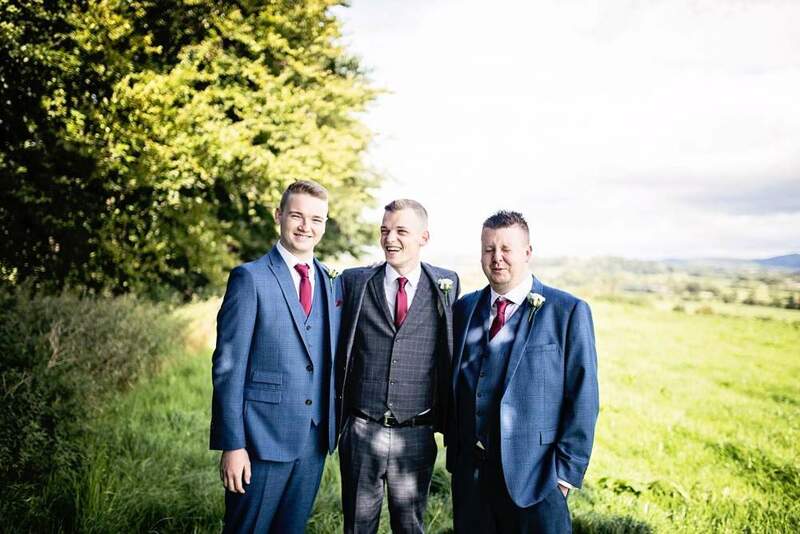 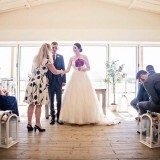 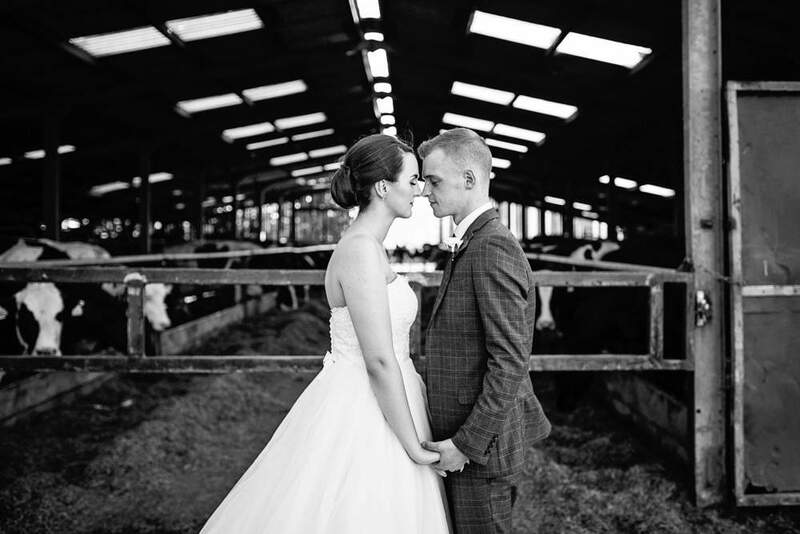 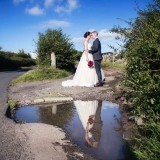 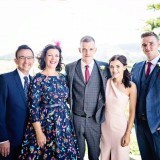 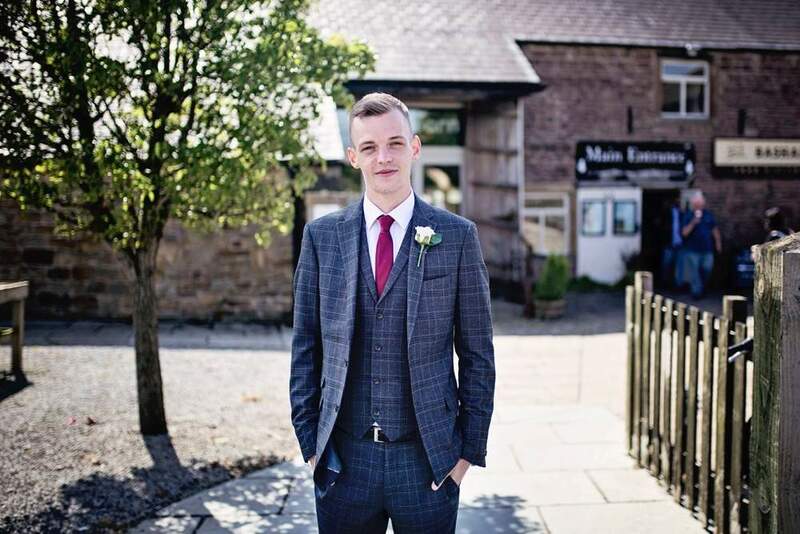 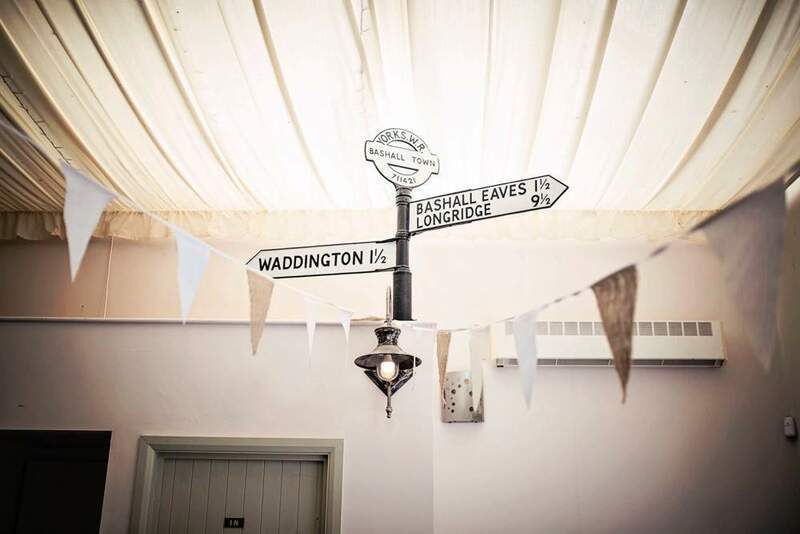 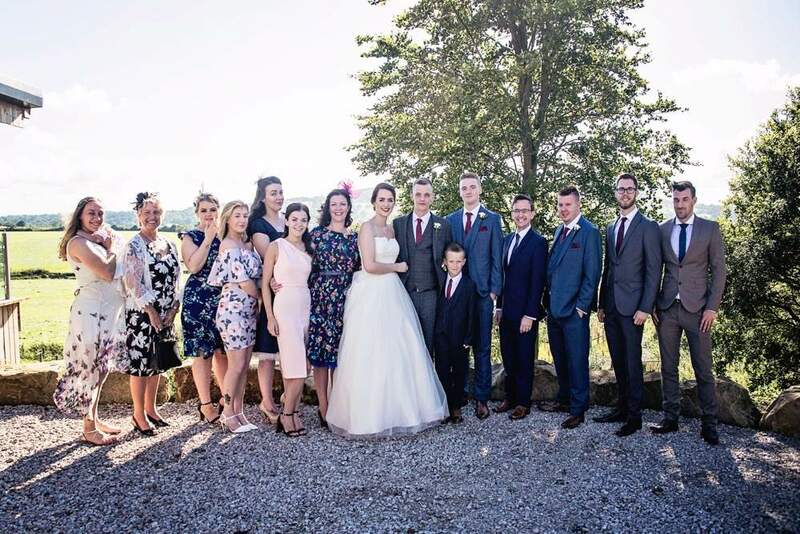 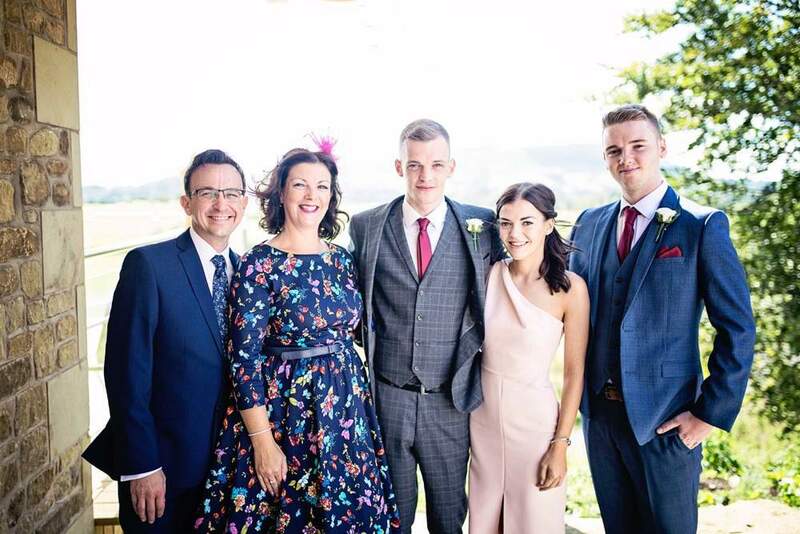 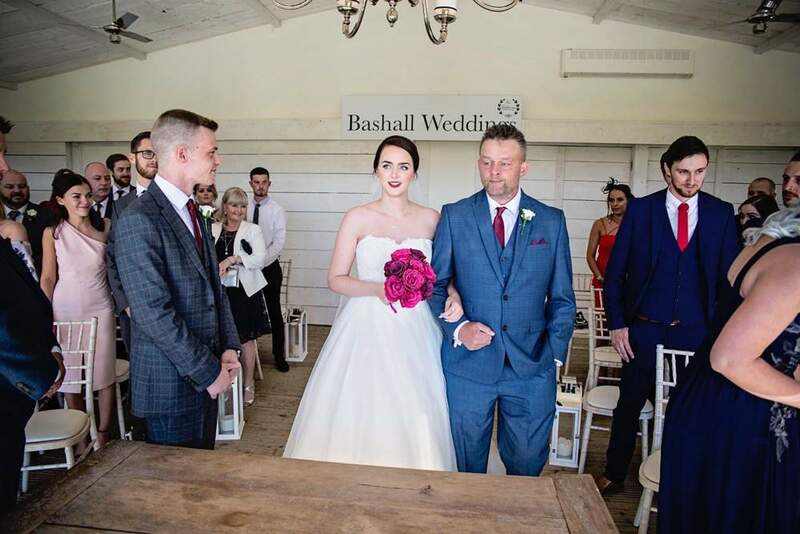 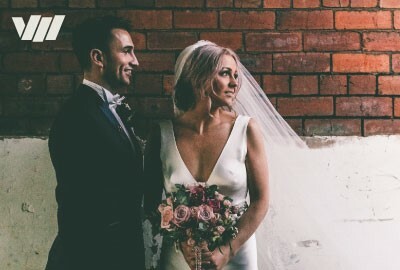 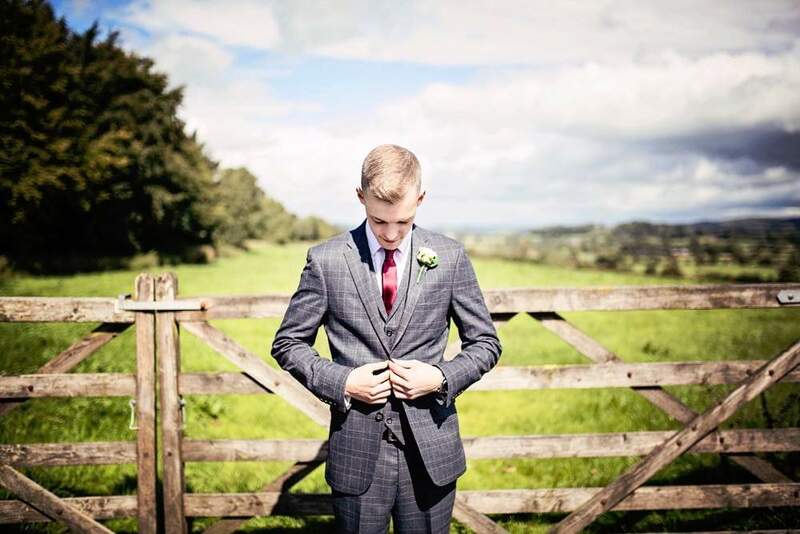 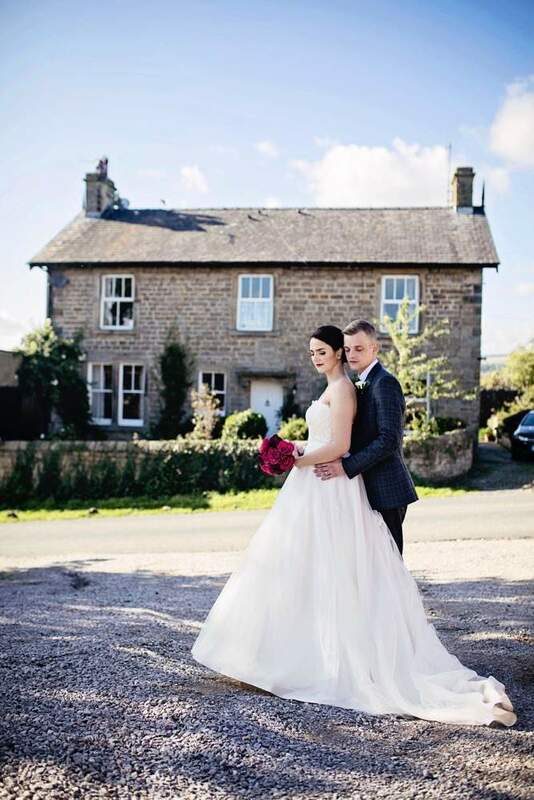 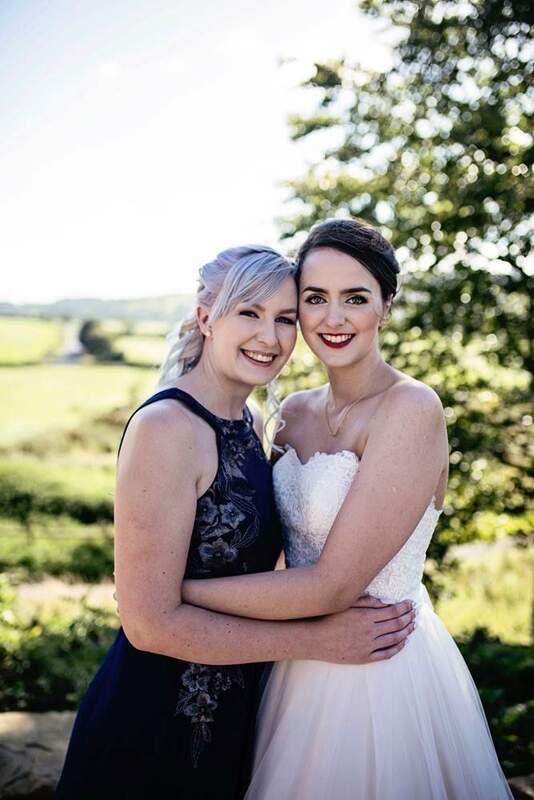 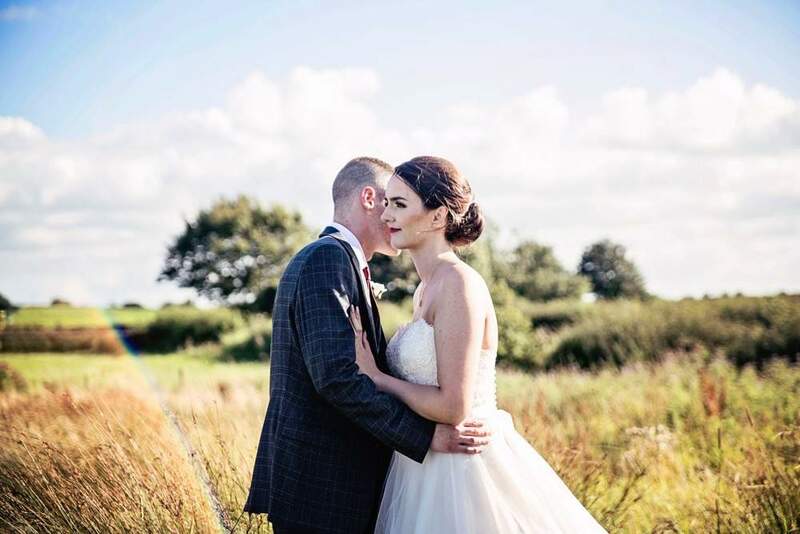 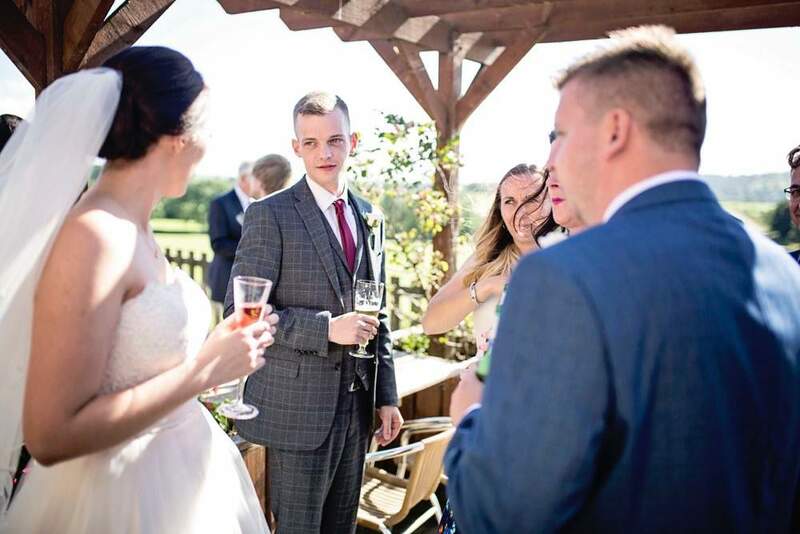 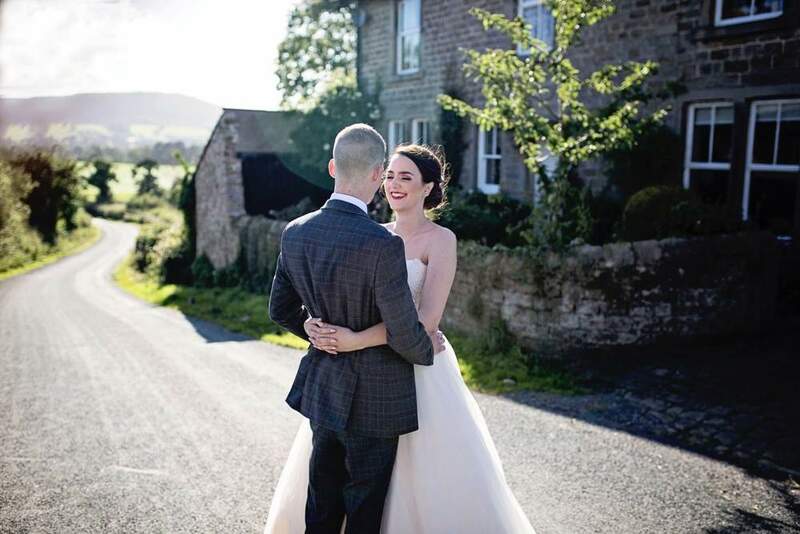 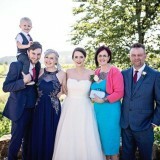 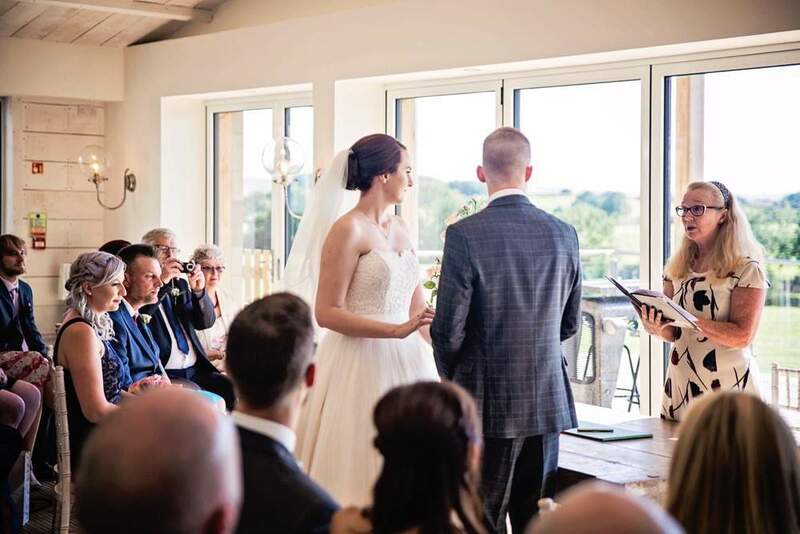 Today’s rustic wedding takes place on a working dairy farm in the heart of Lancashire, providing a rural backdrop to our couple’s special summer wedding. 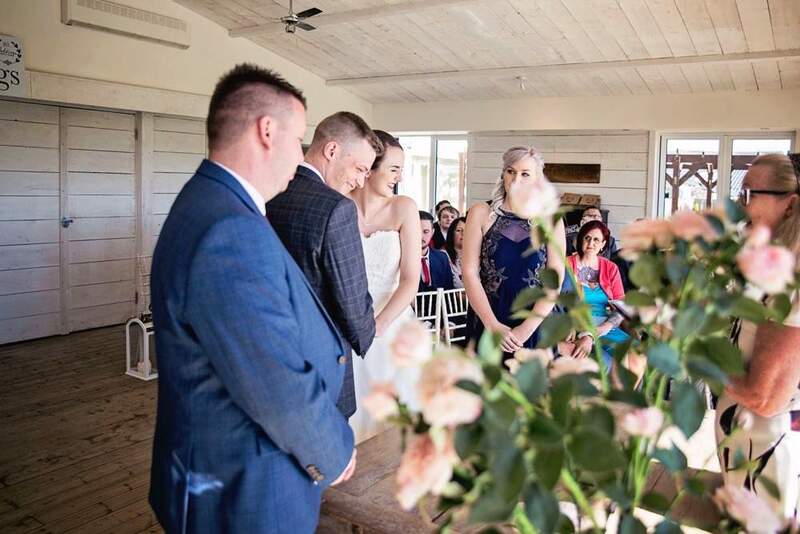 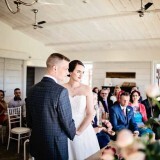 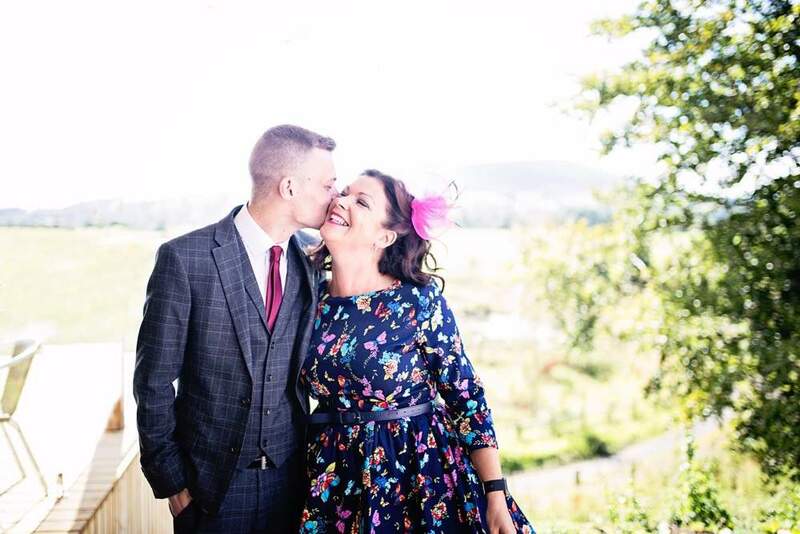 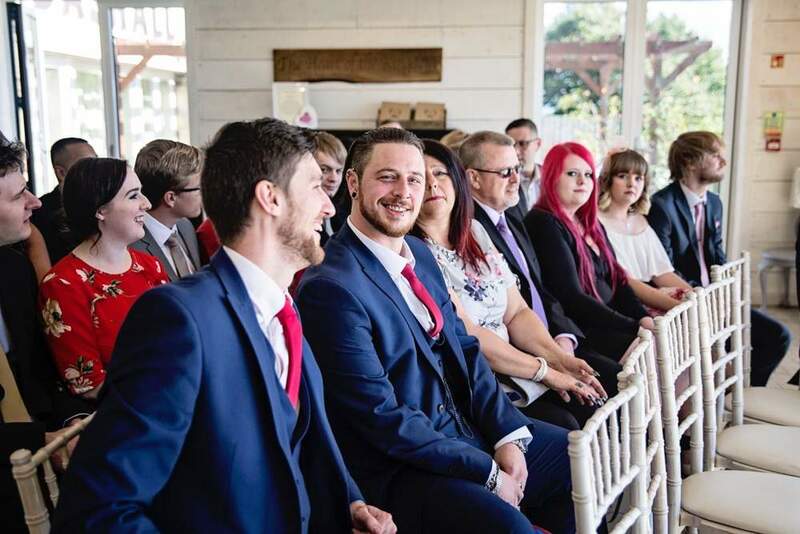 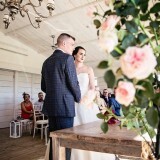 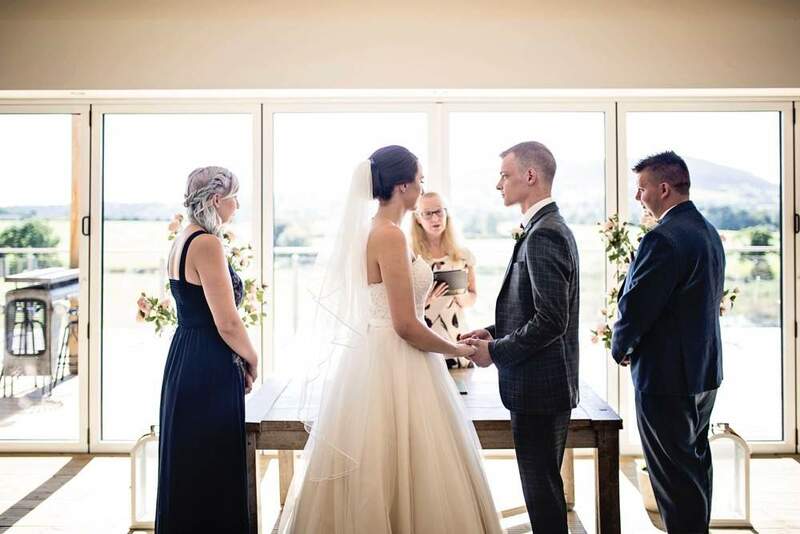 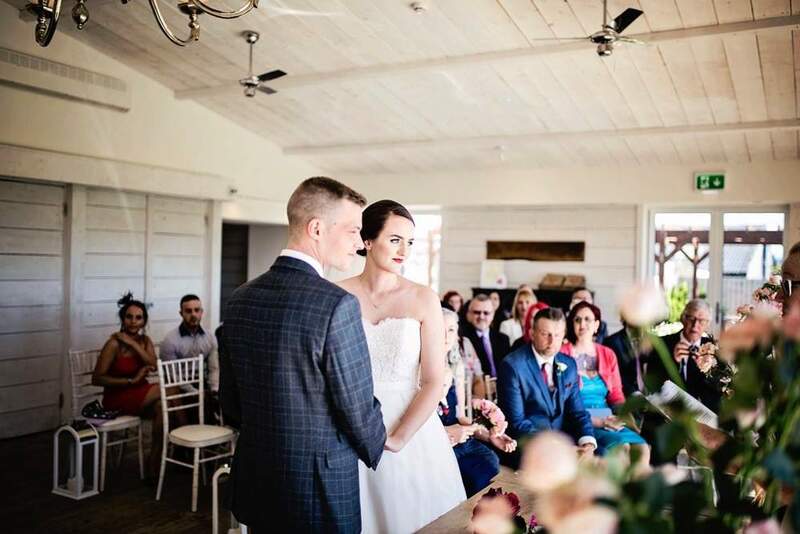 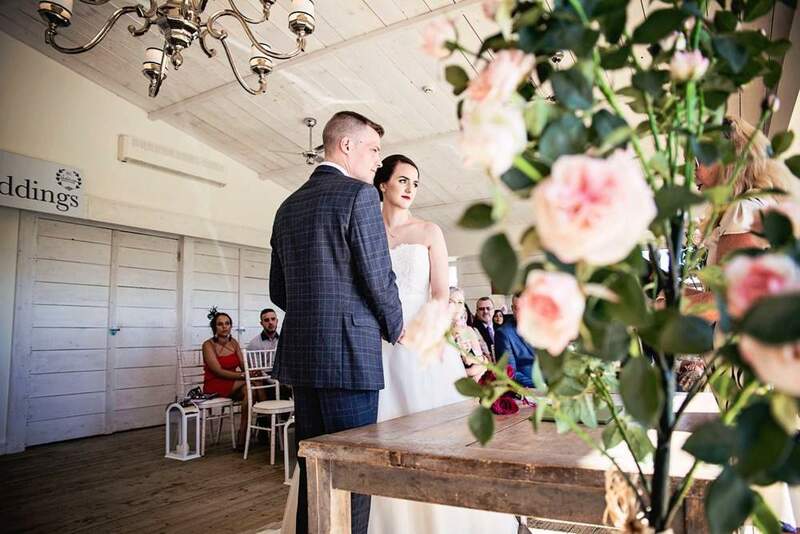 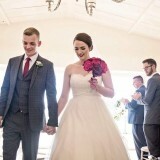 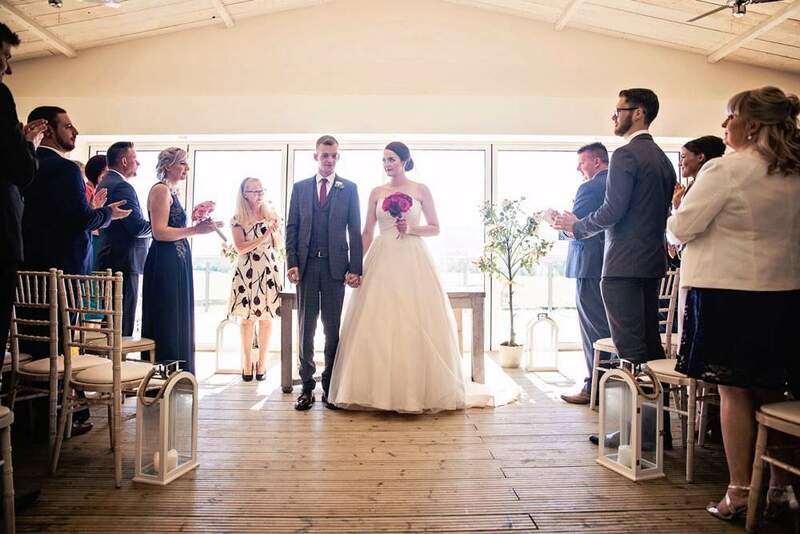 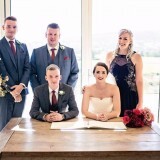 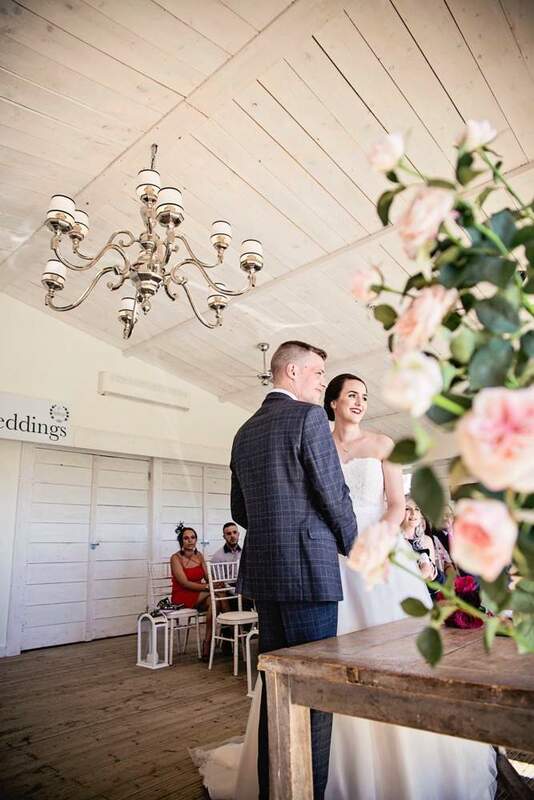 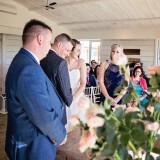 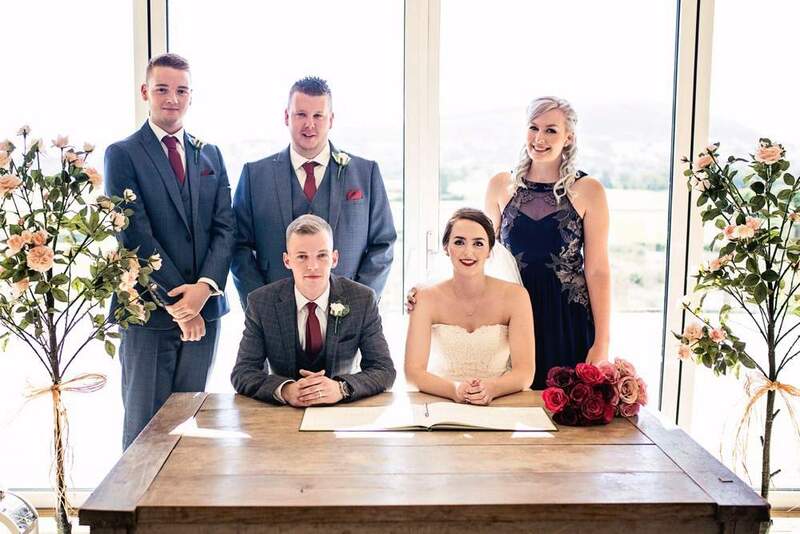 Nici and Kris tied the knot back in August, blending a sophisticated burgundy and navy colour scheme with a hint of Disney, no less. 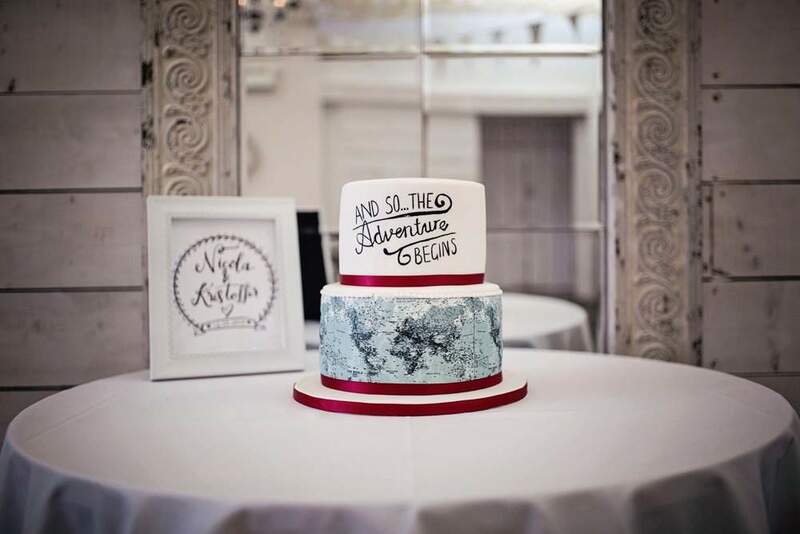 Plenty of personalised, vintage touches can be found throughout too, and we just love the special quote that adorned their wedding cake. 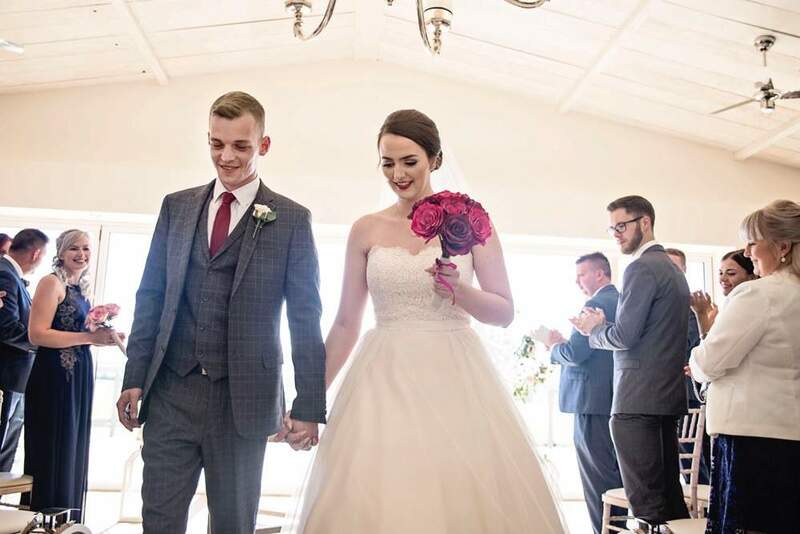 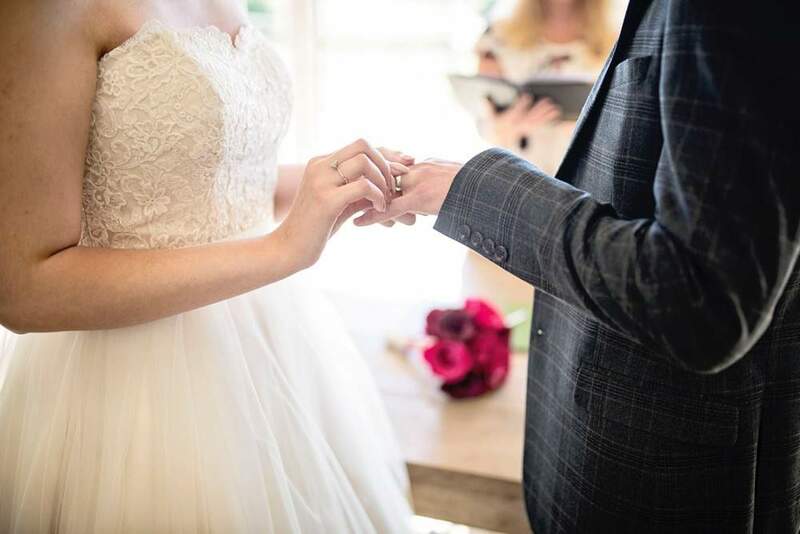 Perhaps the most special of moments was the meteor shower that lit up the night sky – we couldn’t imagine a more fitting highlight to their special day; a real-life Disney-style ever after if ever we saw one. 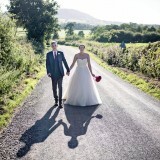 With images by Ginger and Lime Photography. 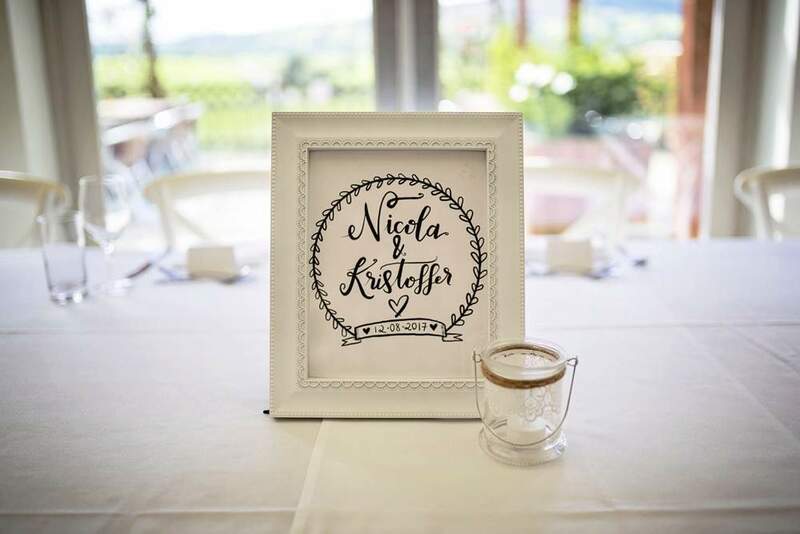 nici says: Kris and I got engaged when visiting Budapest in September 2016. 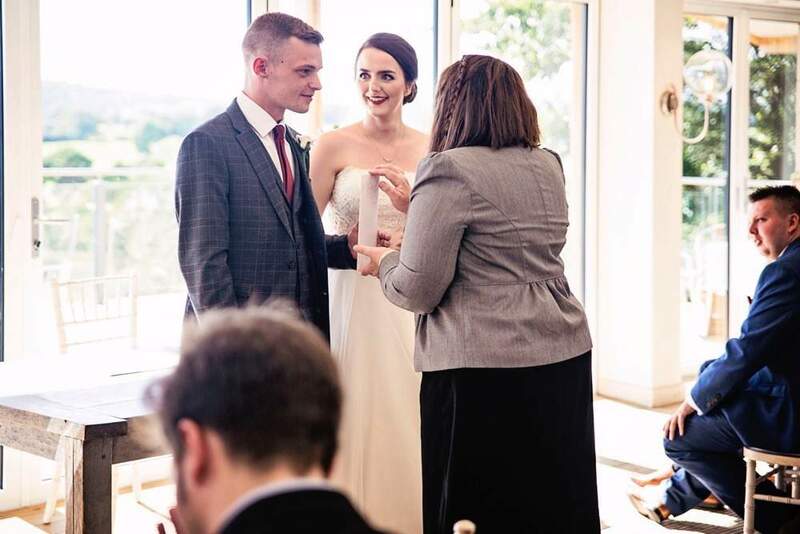 We had a beautiful day in Buda sightseeing, which was made even better when Kris proposed at the Fisherman’s Bastion, which overlooks the city. 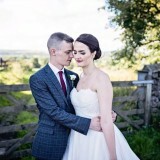 We knew that we didn’t want a long engagement and so we married on 12th August 2017, at Bashall Barn in Clitheroe. 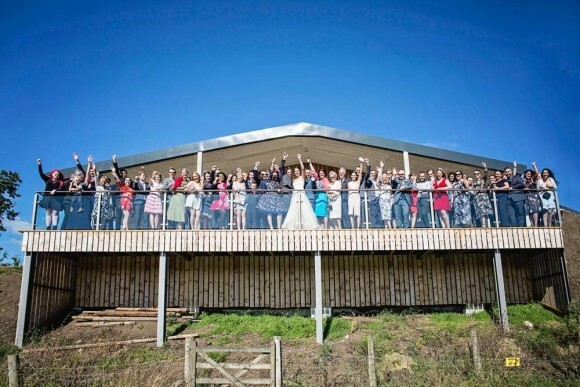 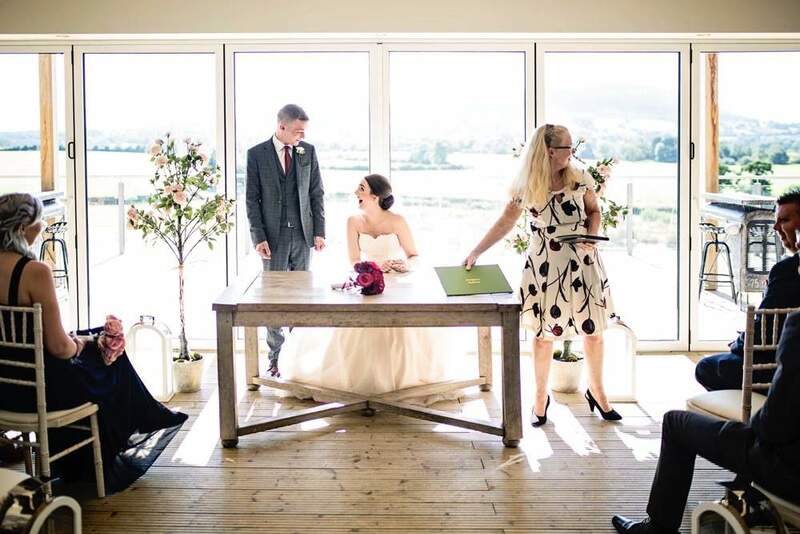 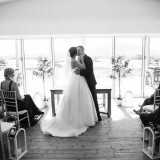 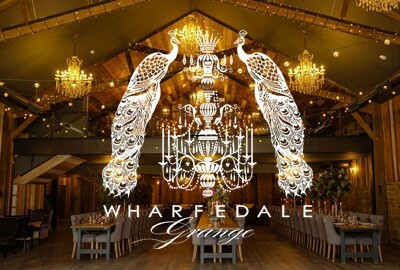 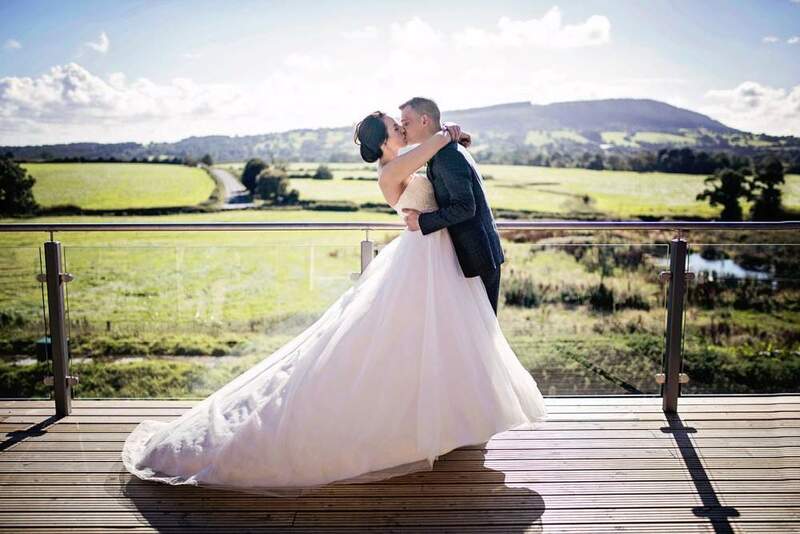 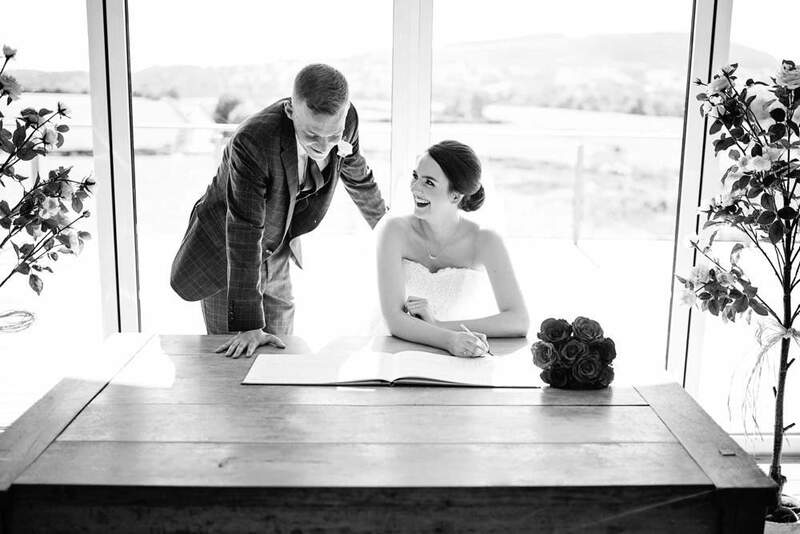 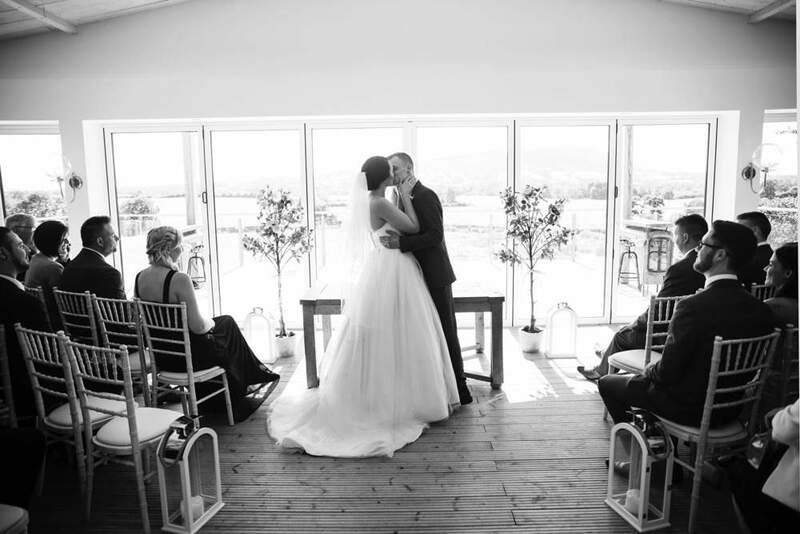 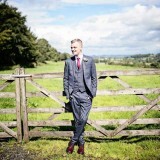 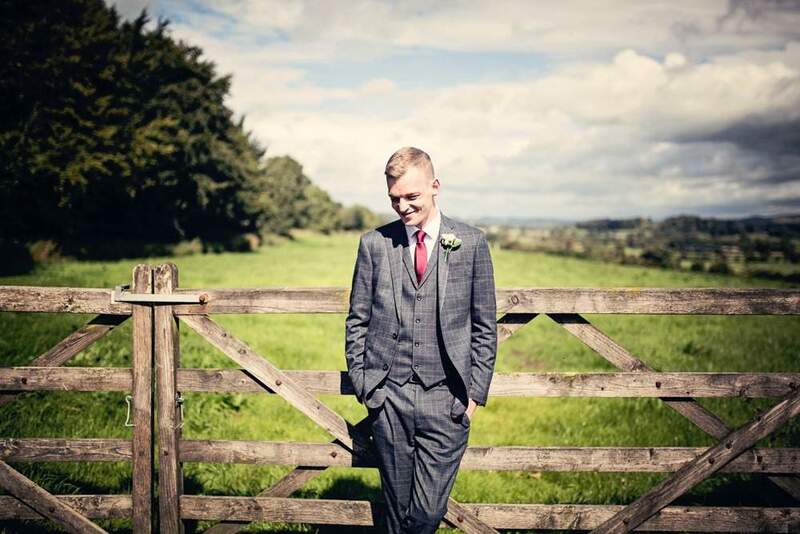 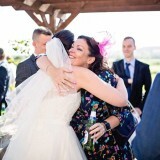 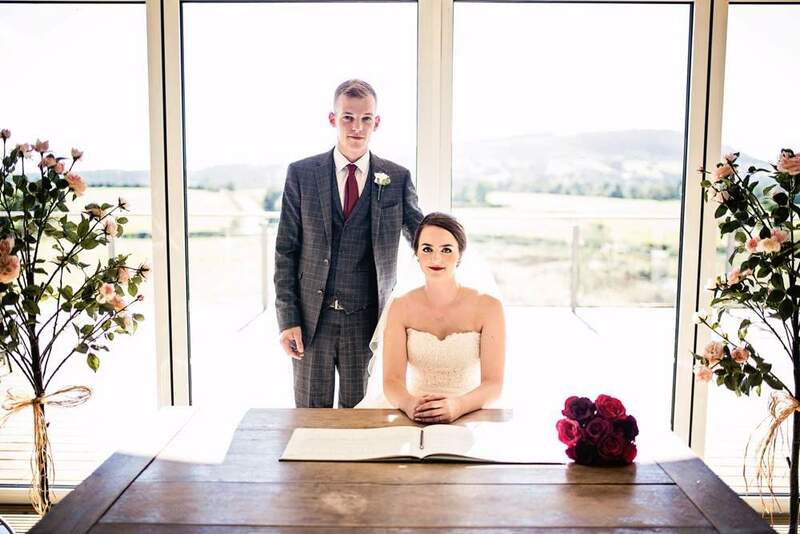 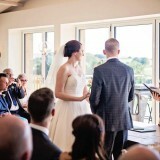 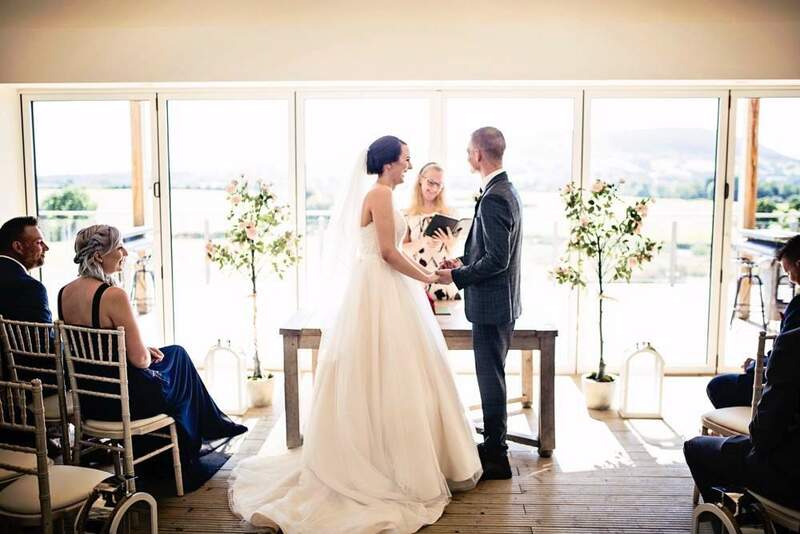 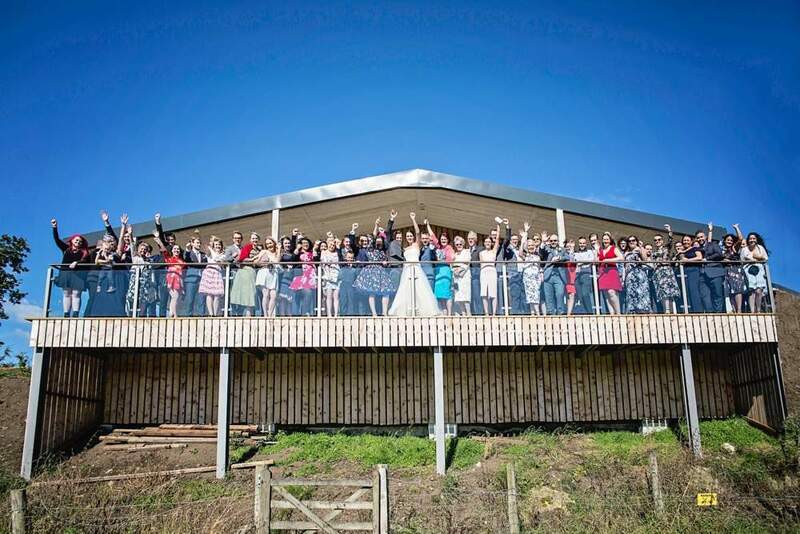 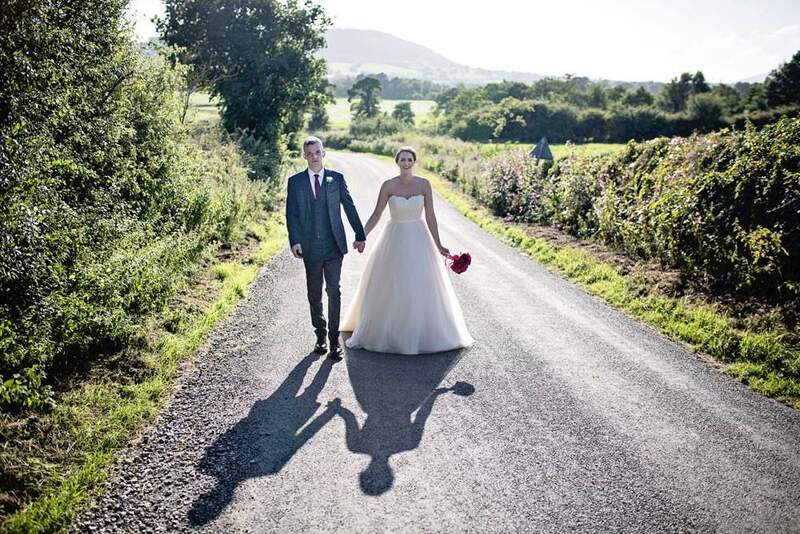 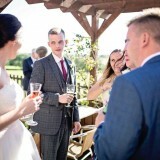 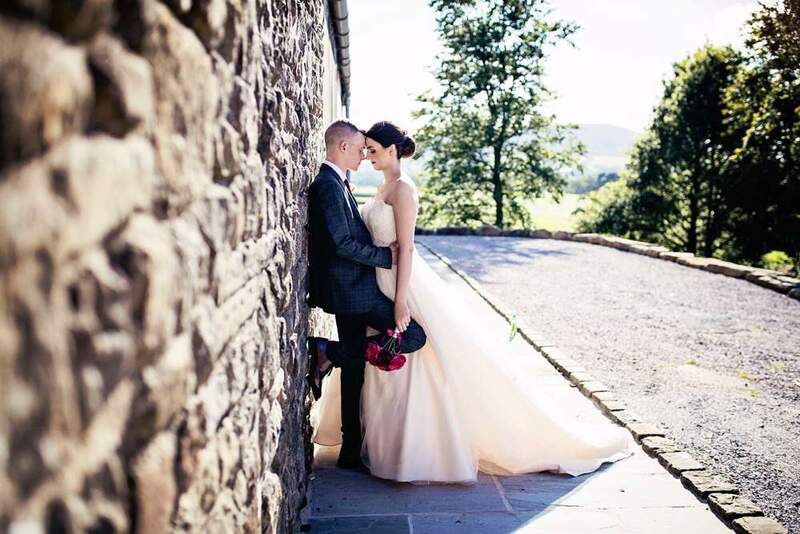 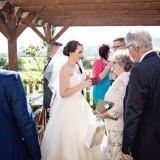 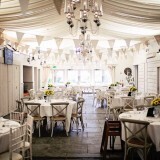 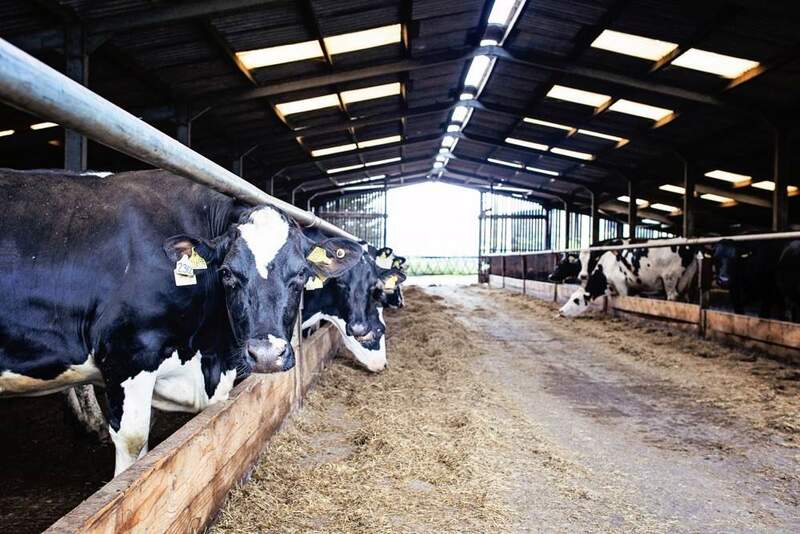 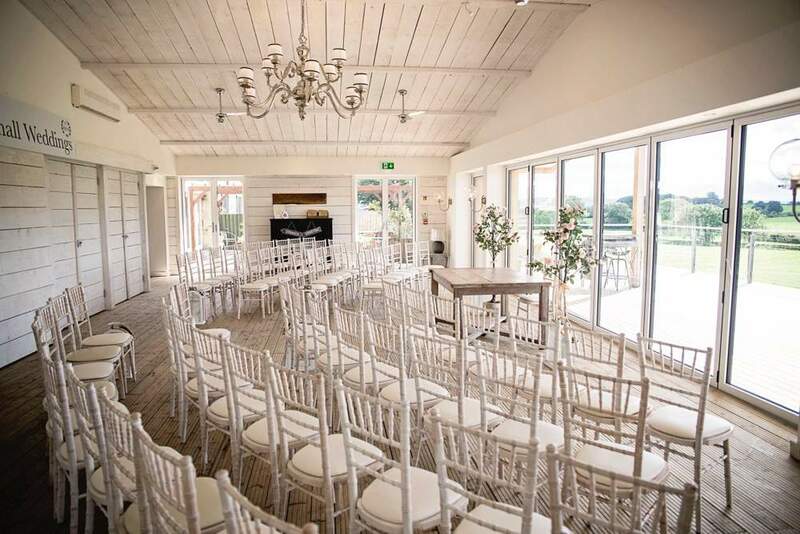 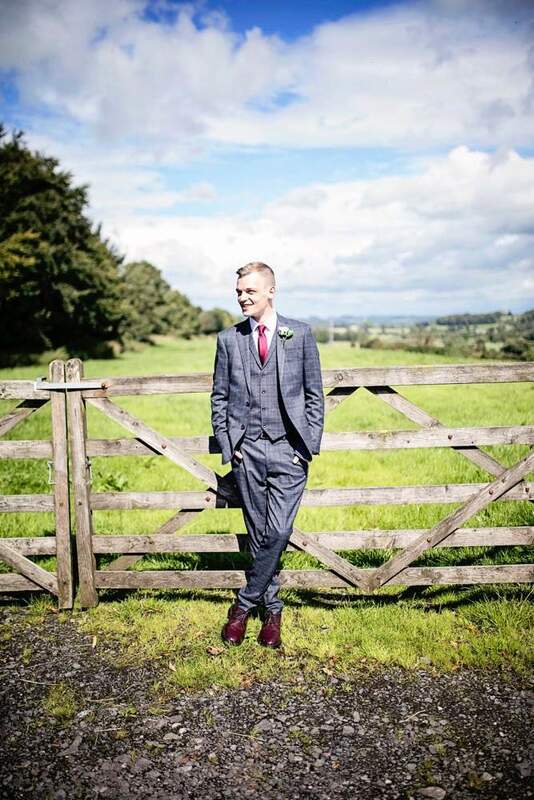 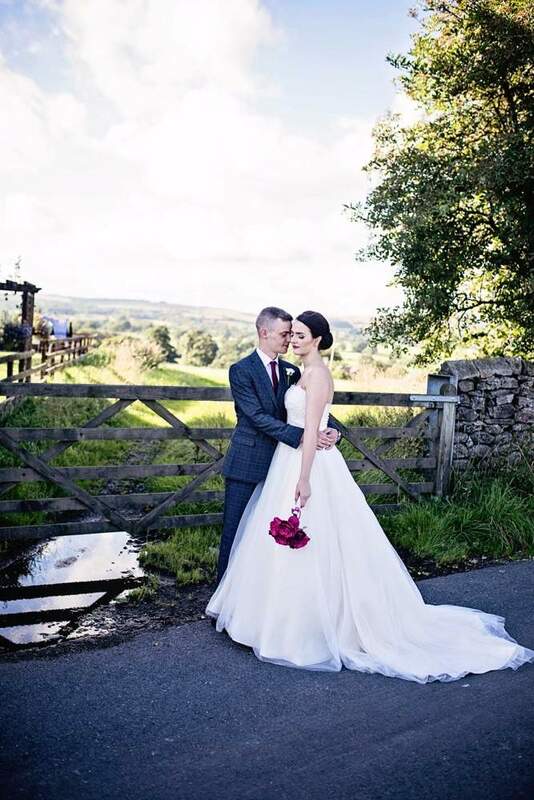 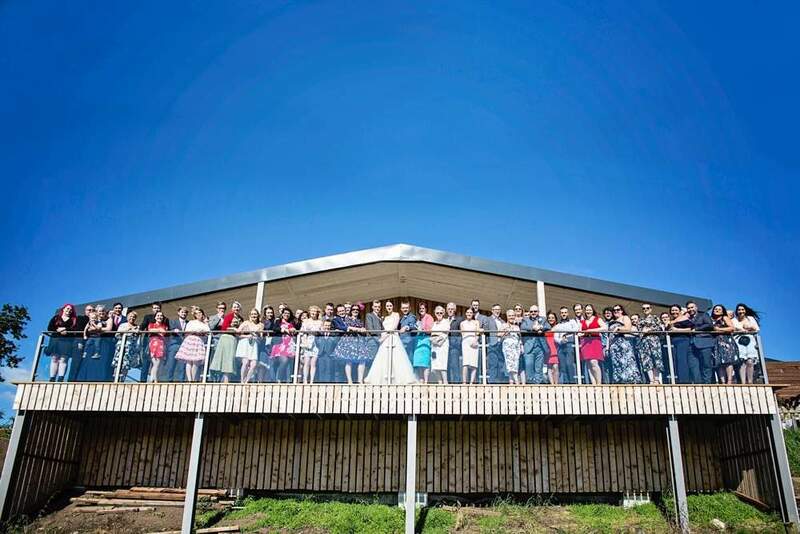 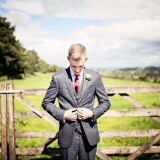 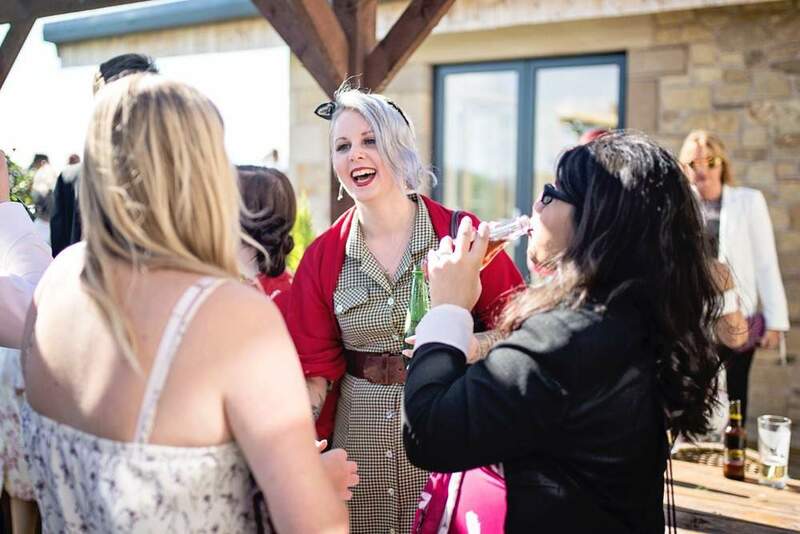 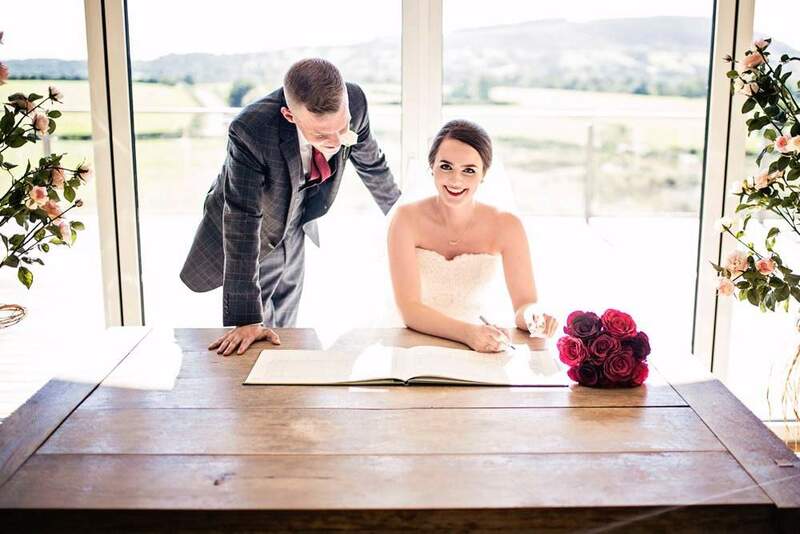 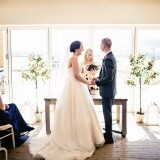 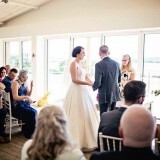 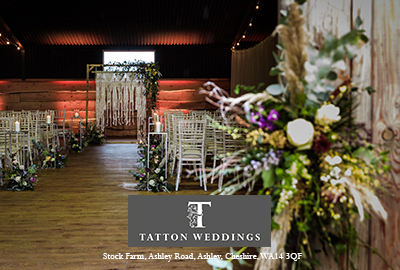 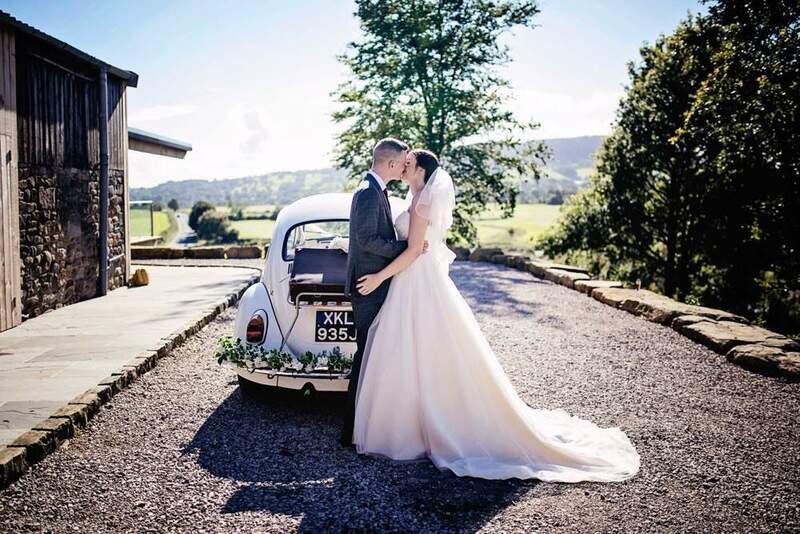 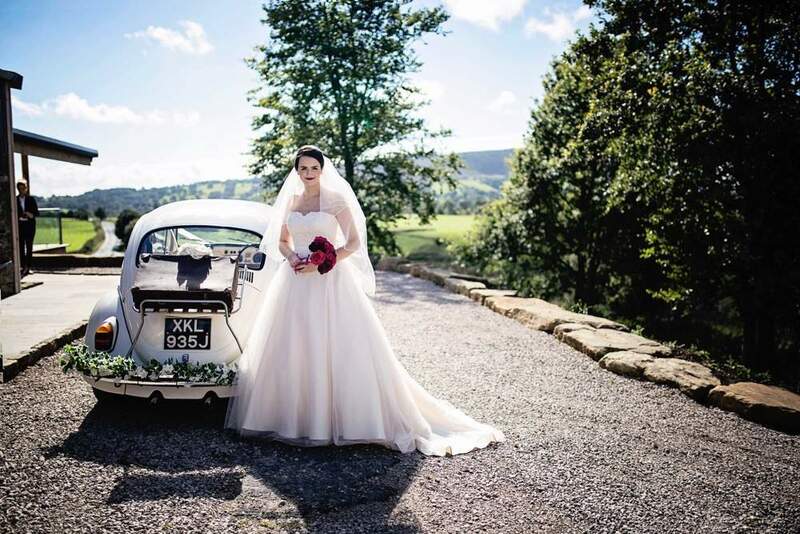 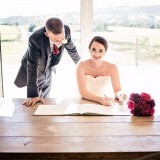 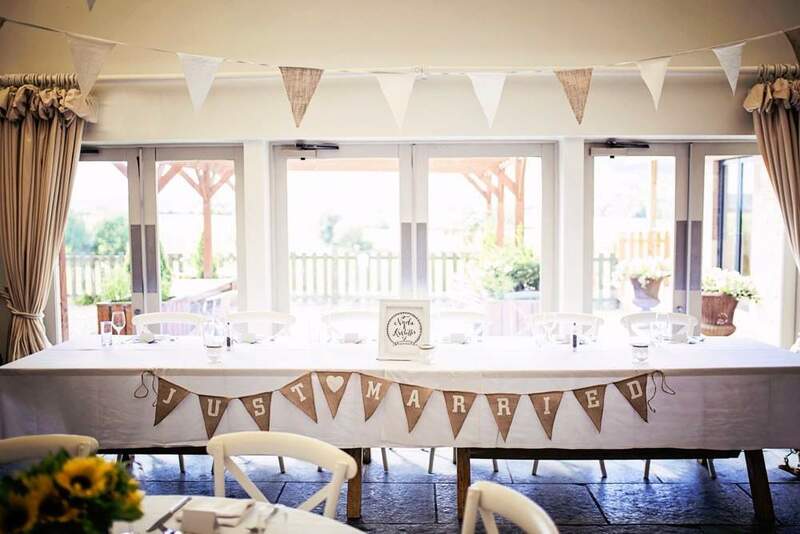 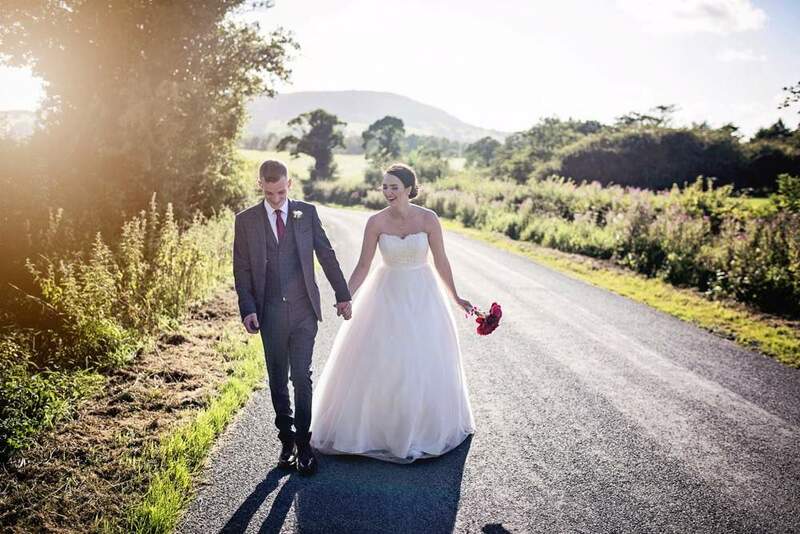 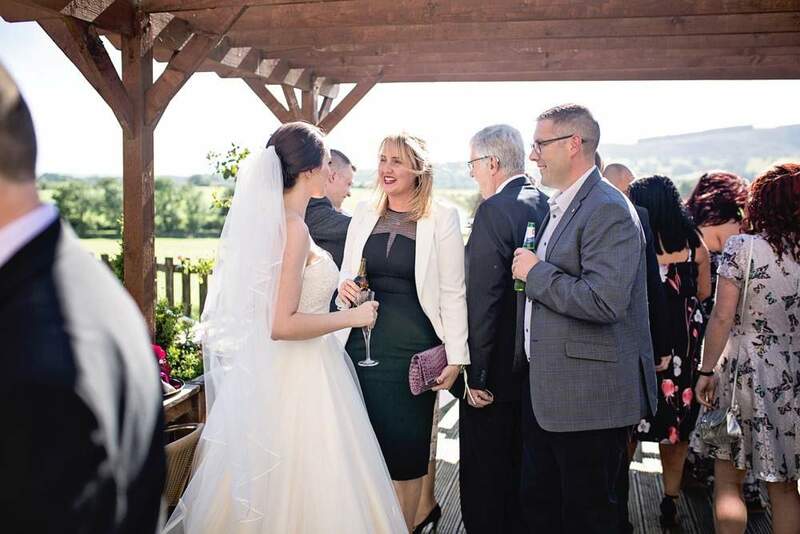 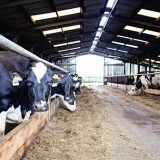 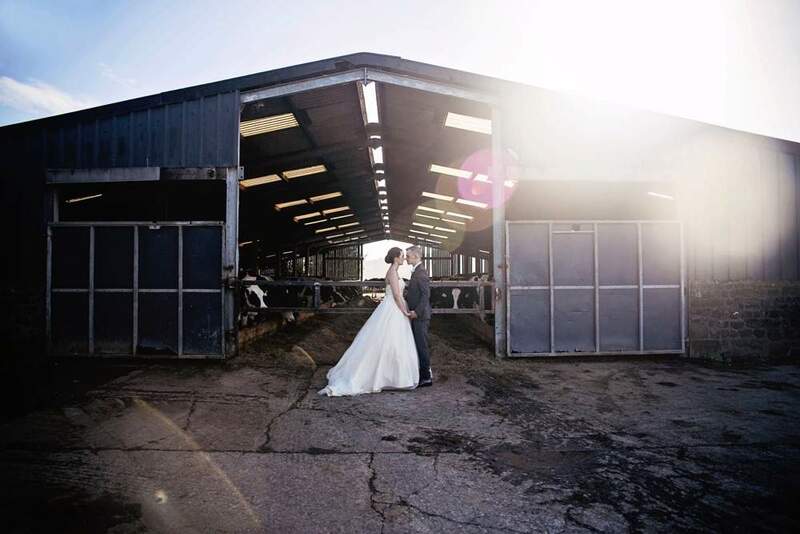 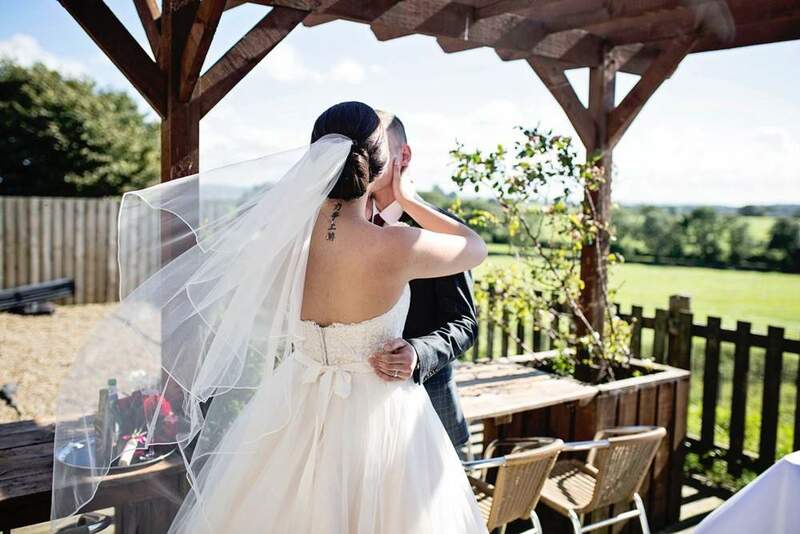 The venue is a working dairy farm which overlooks the Ribble Valley. 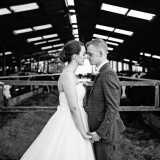 We really wanted to get married in a barn or farm, but wanted something a little bit different. 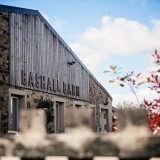 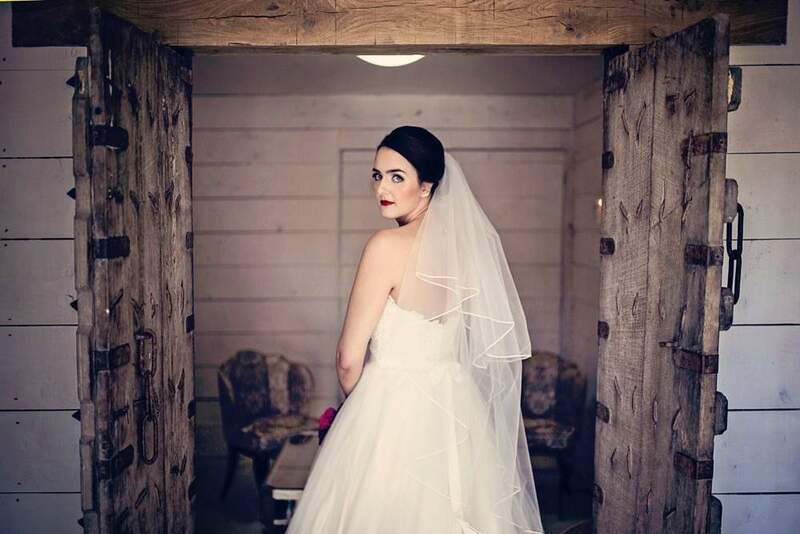 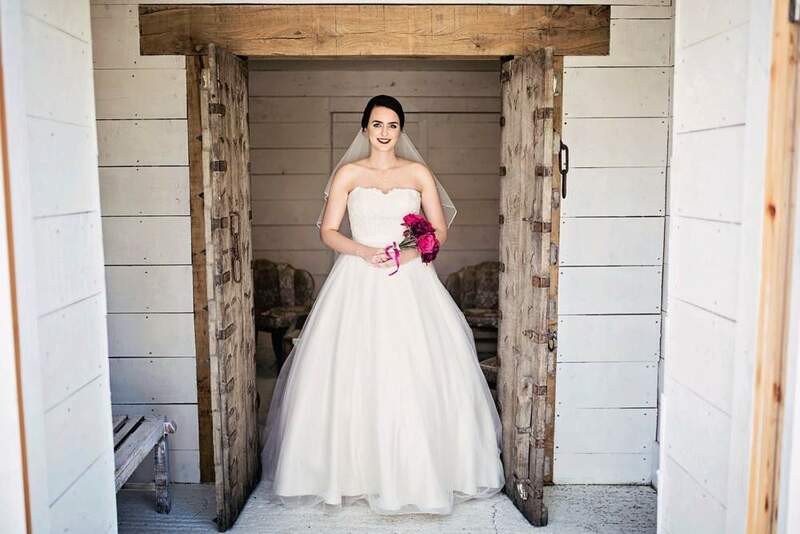 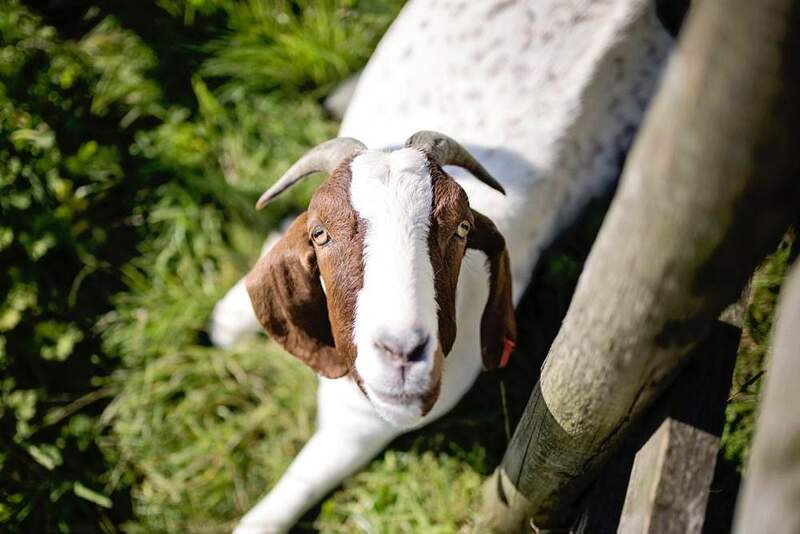 I visited Bashall Barn with my sister, Laura, and fell in love with it straight away. 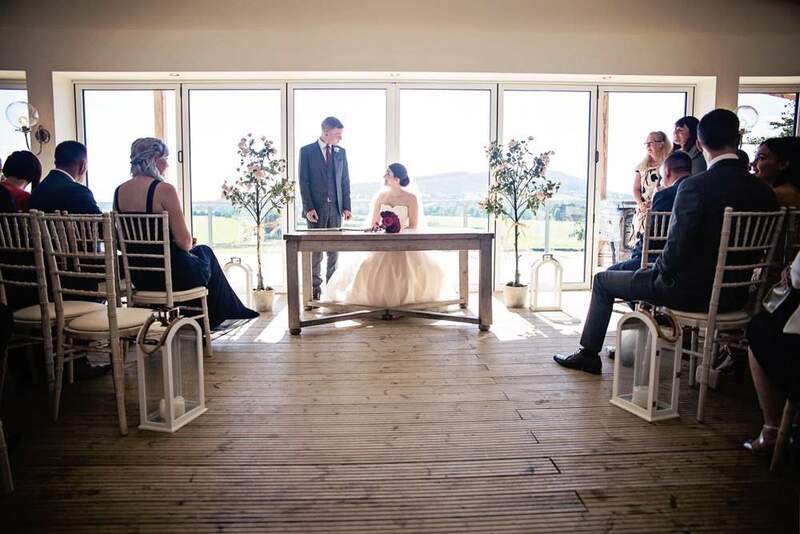 The views are breath-taking, captured through huge glass windows. 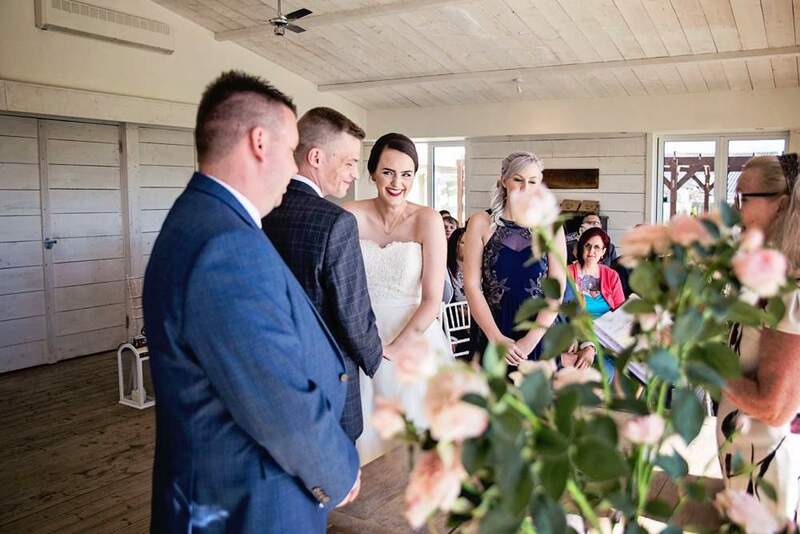 I couldn’t wait for Kris to see it too, but was nervous he wouldn’t love it as much as I did (especially as it would mean our guests would need to travel). 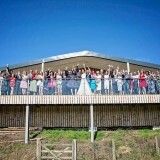 However, I’m safe to say the venue ticked all of our boxes and Kris fell in love with it too. 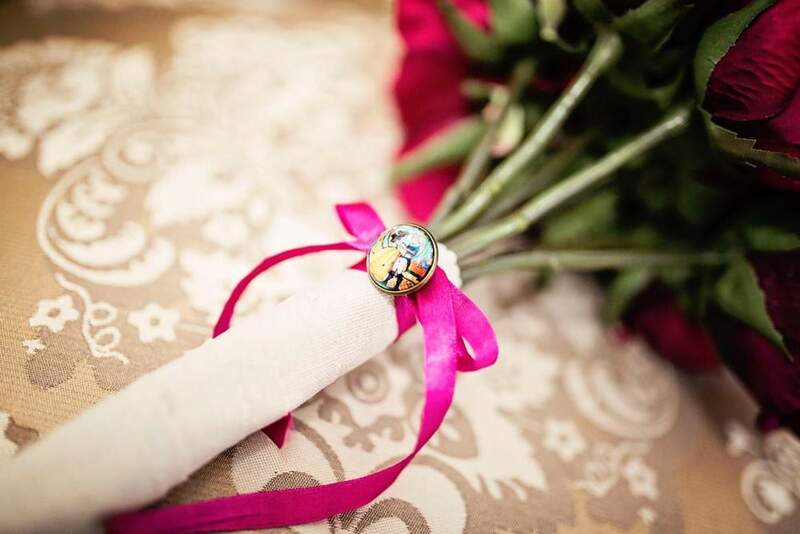 I subtly incorporated a Disney theme into our day. 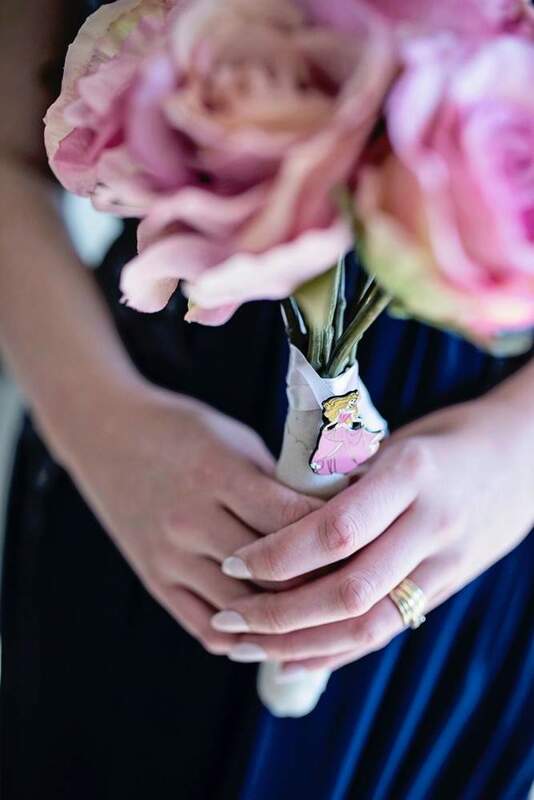 My sister and I had a brooch of our favourite Disney films on our bouquets. 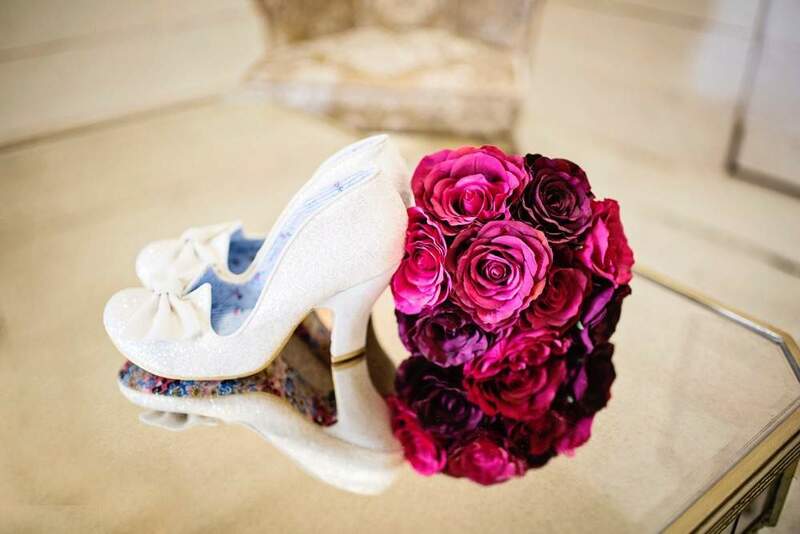 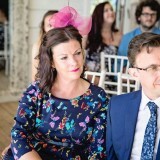 My dress was also called Belle (a nod to Beauty and the Beast) and I wore glittery Irregular Choice shoes called In The Nick Of Time (paying homage to Cinderella) for the ceremony. 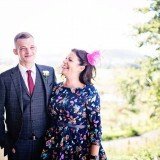 I also wore Toy Story Vans for the evening. 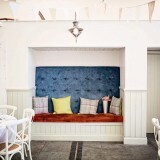 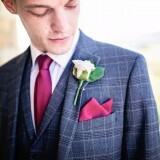 We chose a burgundy and navy colour scheme as we wanted something classic. 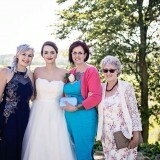 I asked my mum, sister and mother-in-law to come along and help me find a dress from Wed2b in Bolton. 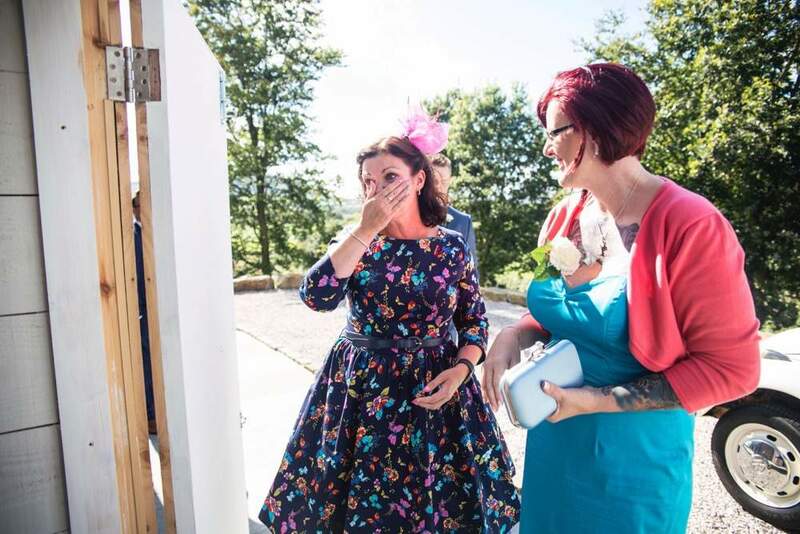 I chose three dresses to take into the dressing room, and my mum suggested another gown that I least expected to wear. 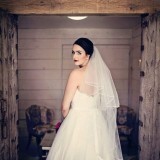 I ended up picking a sweetheart gown in champagne with a long tulle train. 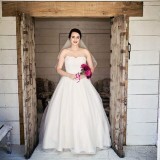 It was the first one I tried on and nothing else compared. 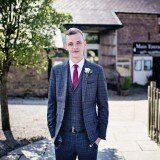 Kris wore a grey three-piece suit from Slaters in Bolton. 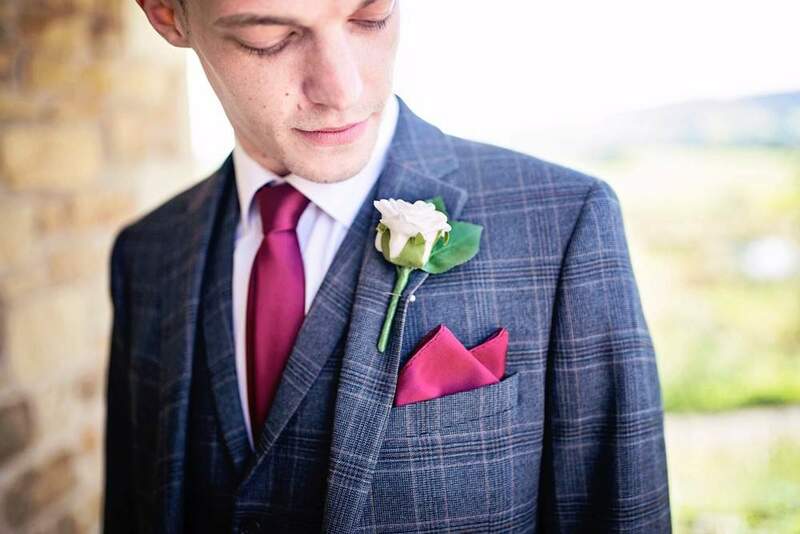 It had a subtle checked pattern. 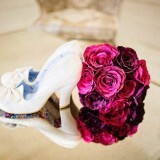 He also wore burgundy shoes from G. H. Bass & Co. 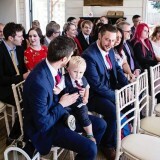 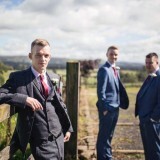 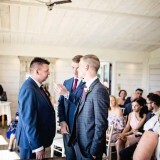 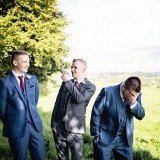 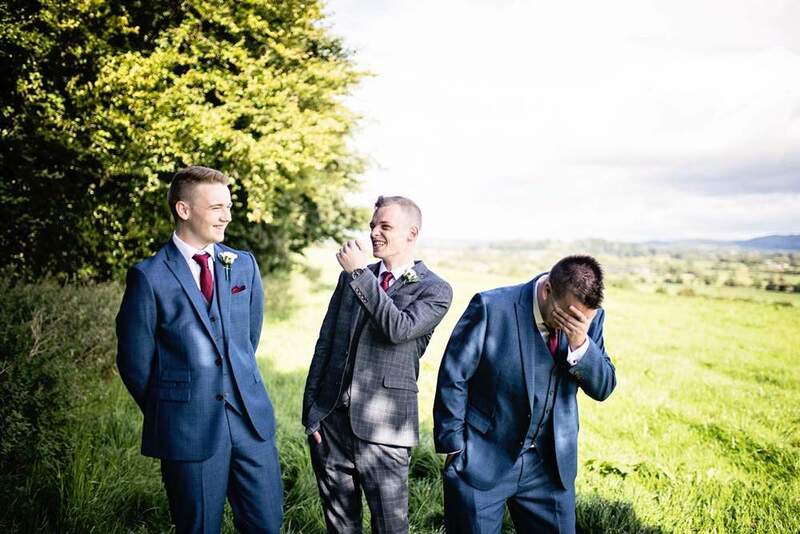 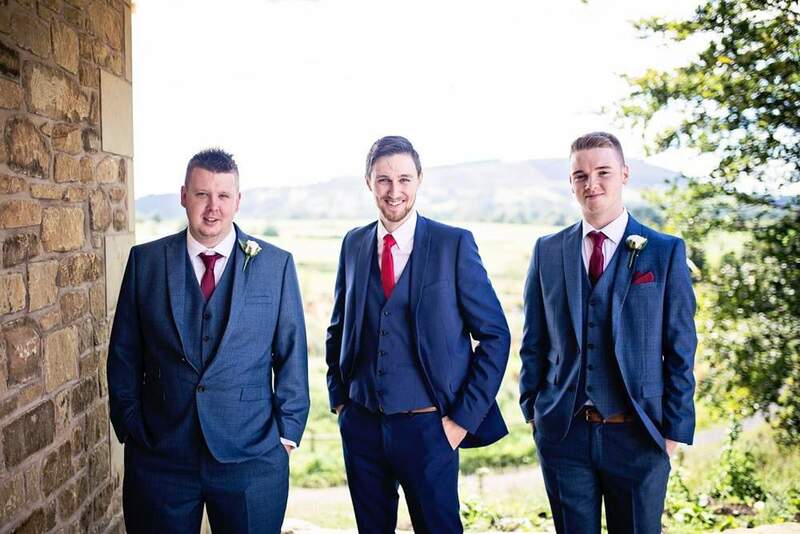 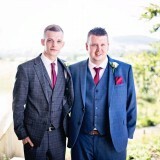 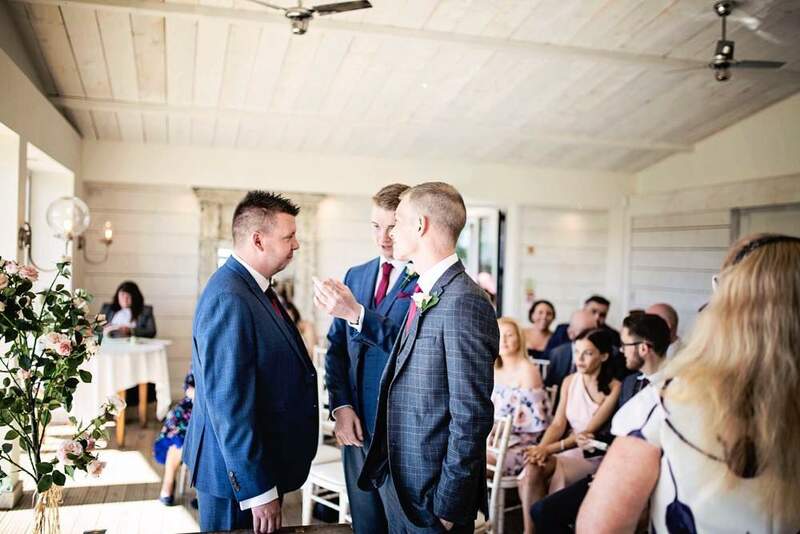 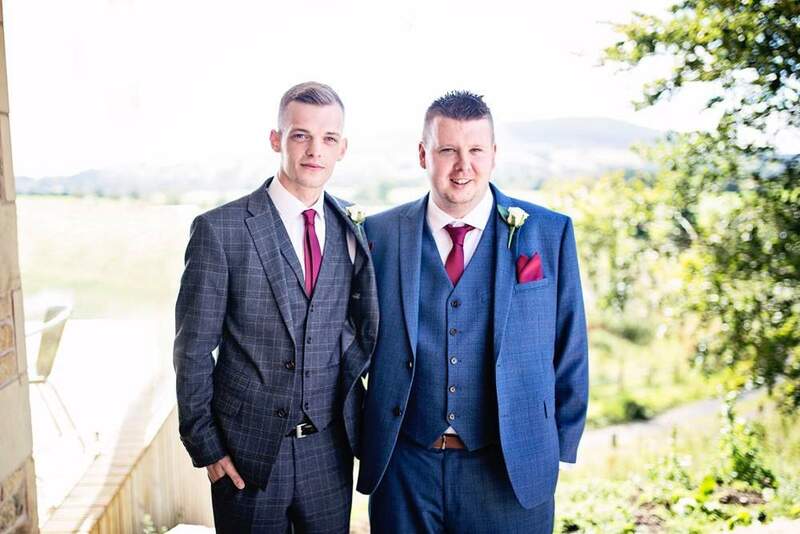 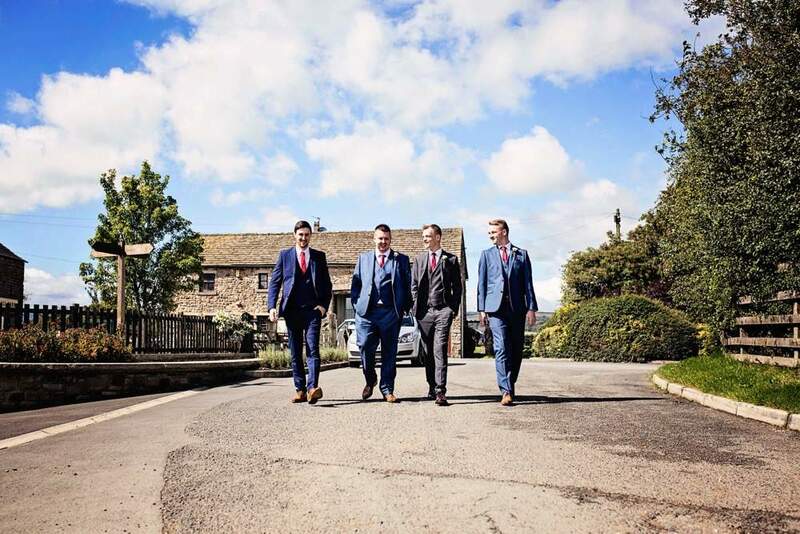 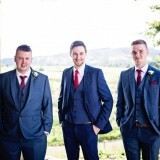 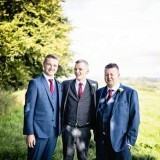 The groomsmen wore matching blue suits, also from Slaters in Bolton. The suits had the same checked pattern as Kris’s and they all wore matching tan shoes and burgundy accessories. 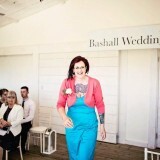 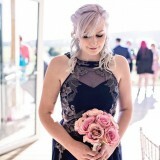 My maid of honour, wore a floor-length navy dress with intricate bronze detailing. 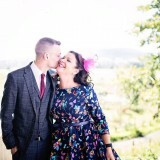 This was from TK Maxx. 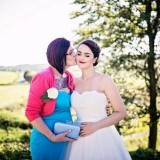 The Northern Bride, Lynsey did my hair and makeup (as well as my mum and maid of honour) on the morning of the wedding. 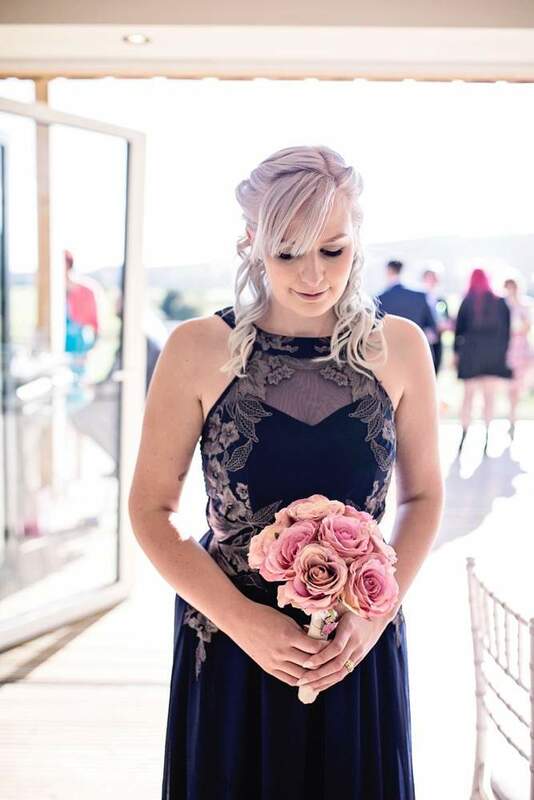 She was absolutely amazing. 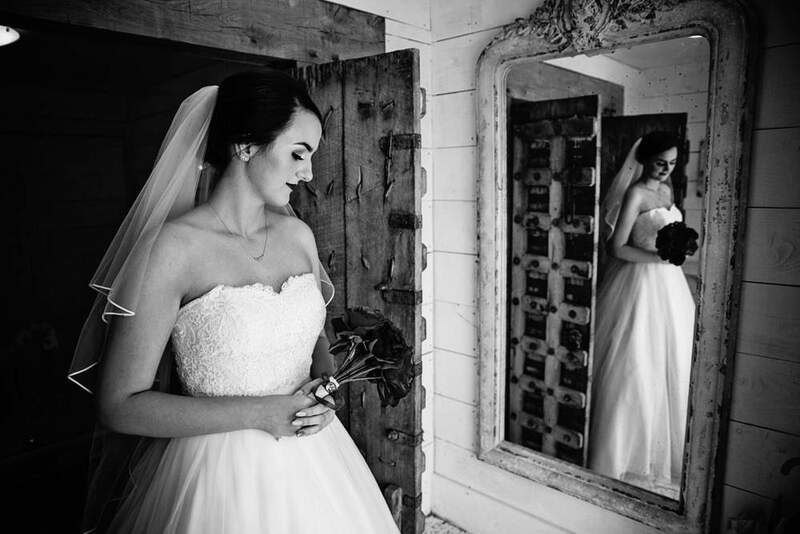 She kept me calm and laughing while getting ready, and my hair and makeup was perfect. 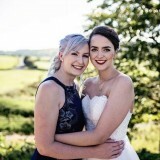 She made me feel like a princess. 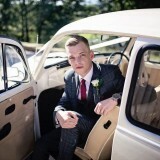 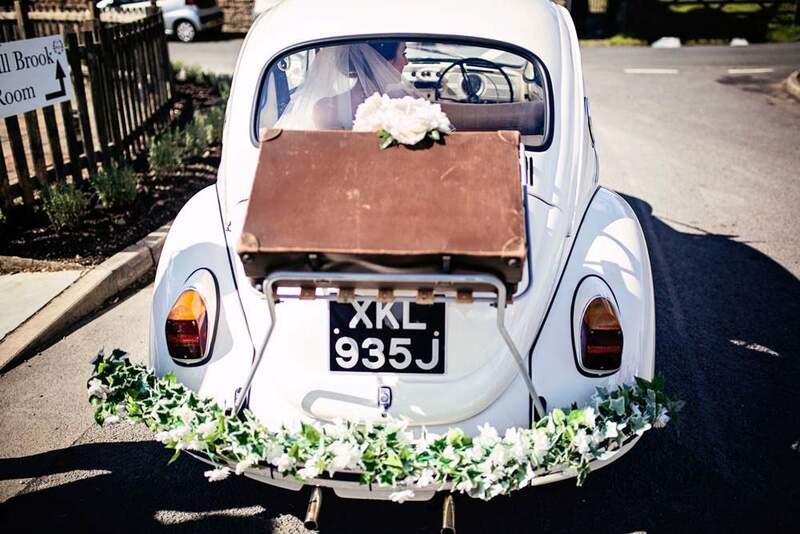 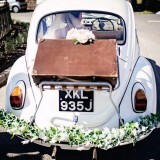 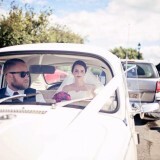 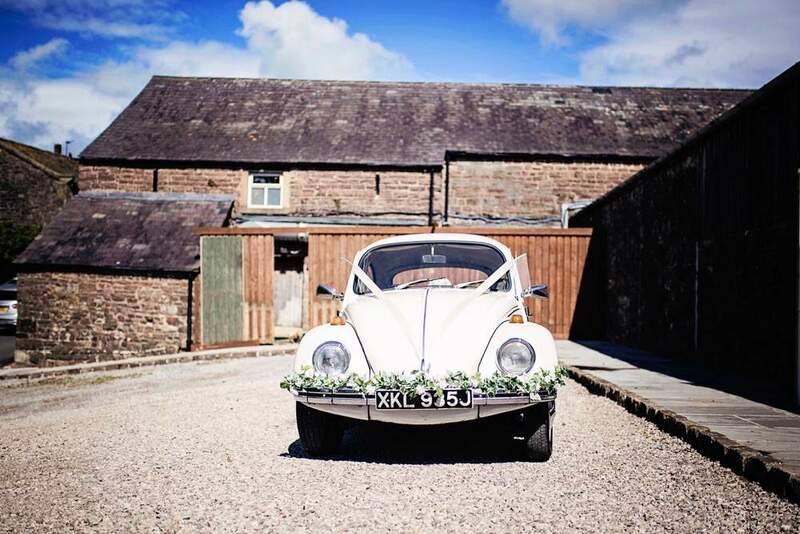 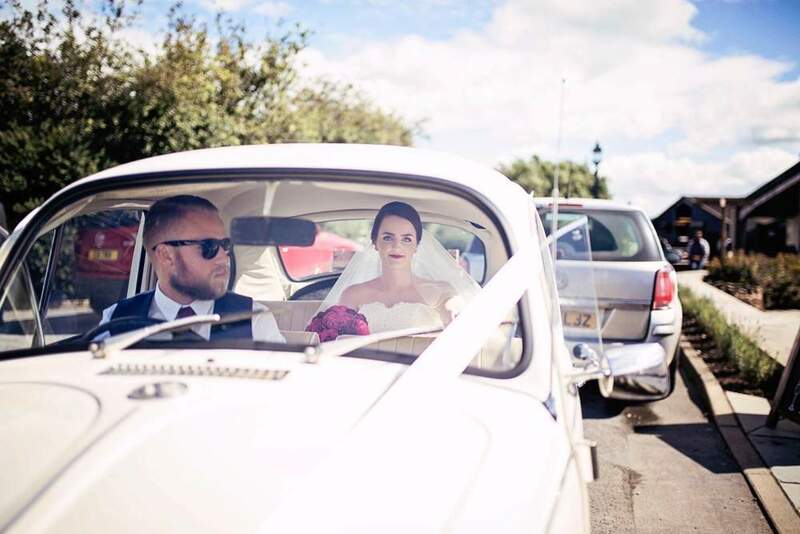 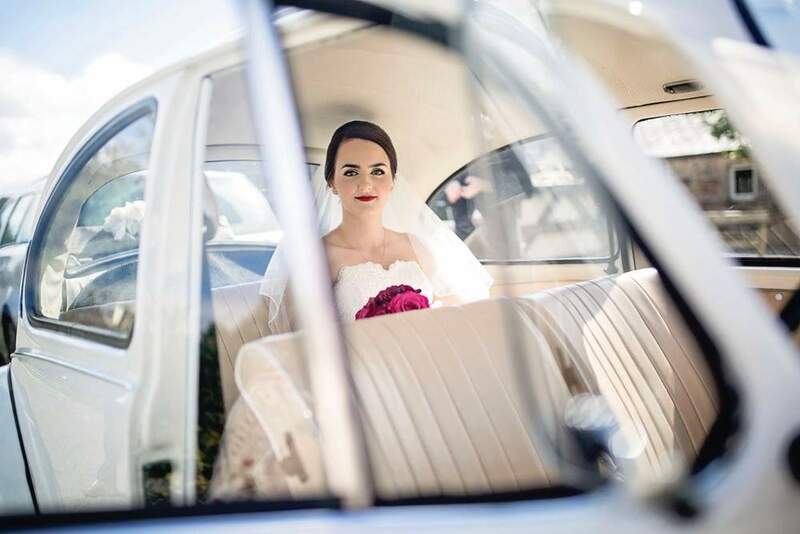 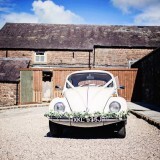 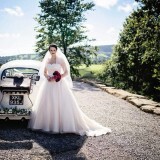 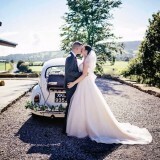 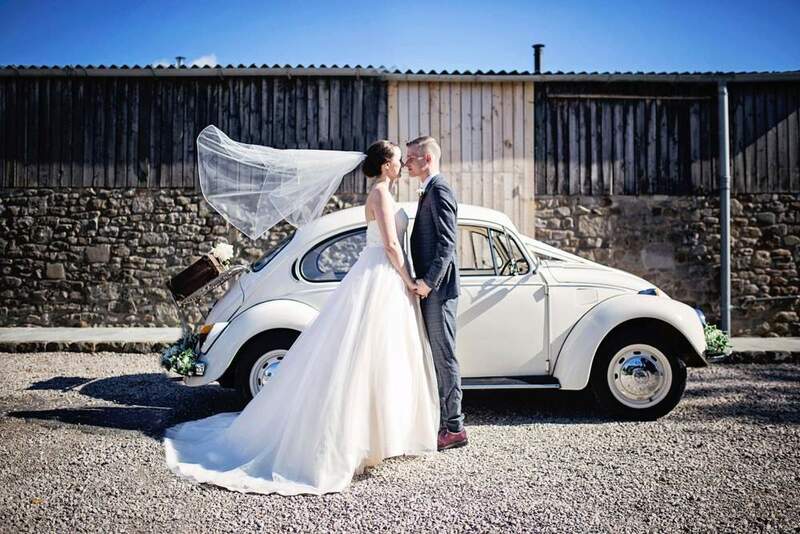 As transport to the venue, we hired a VW beetle from Vintage Love Bugs in Burnley. 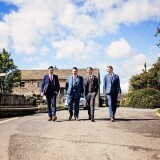 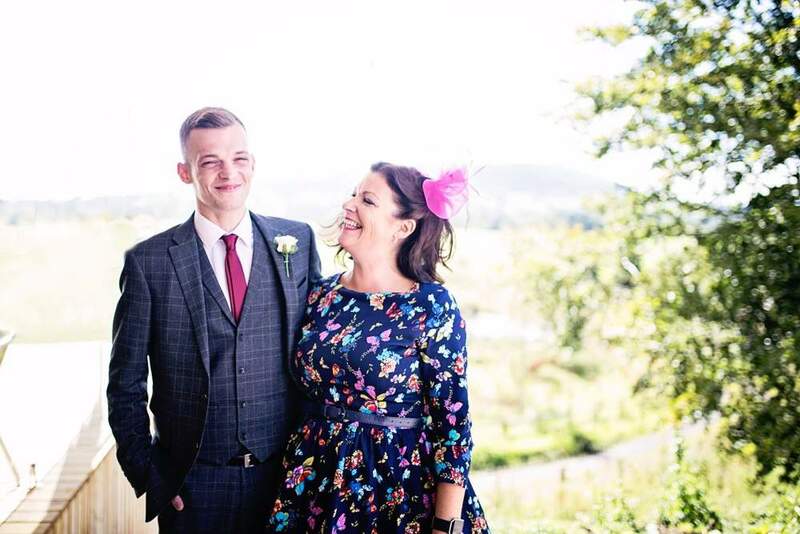 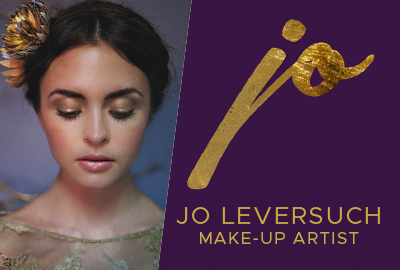 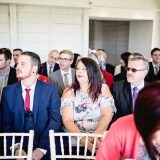 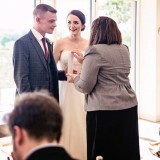 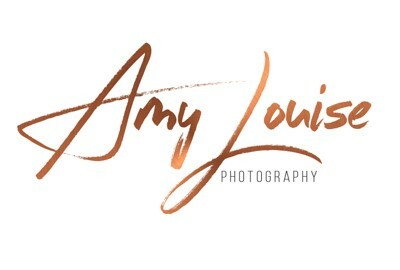 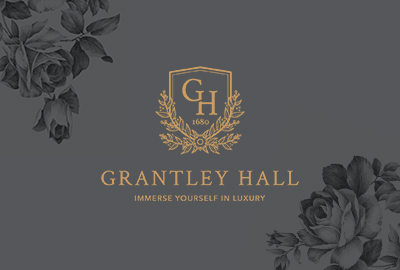 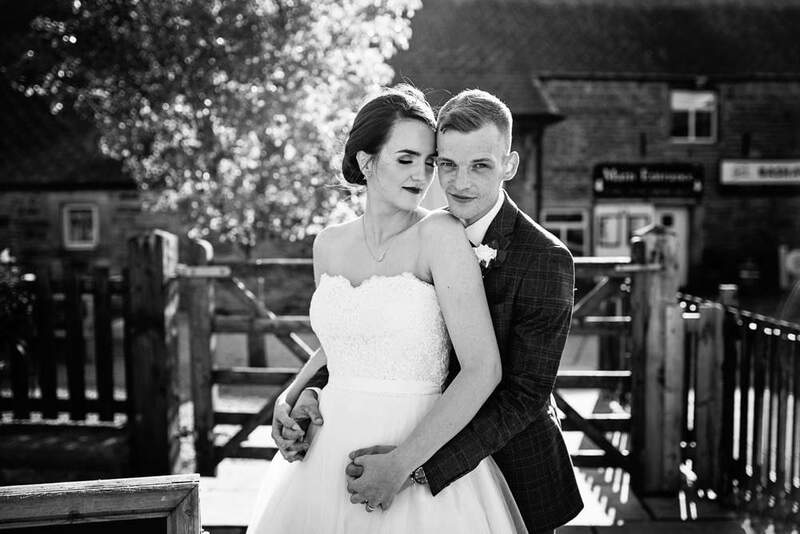 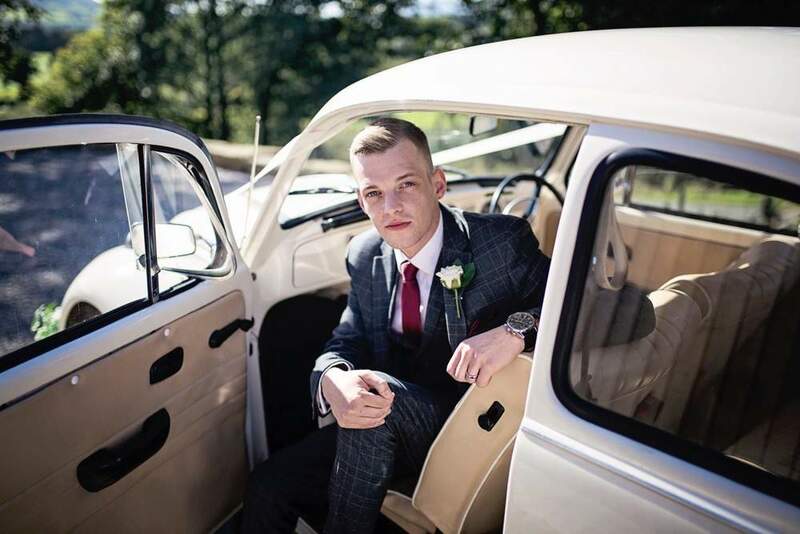 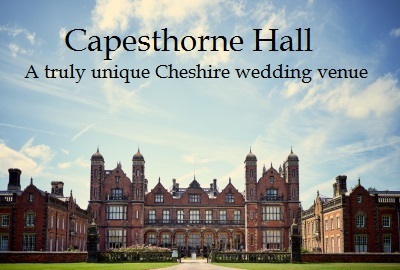 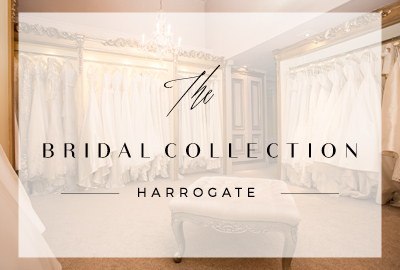 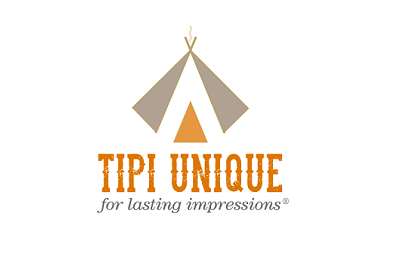 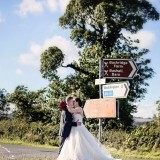 They were absolutely fantastic, from my initial enquiry through to our wedding day. 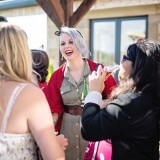 Our photographer was Ginger and Lime Photography by Sylvia Csoma. 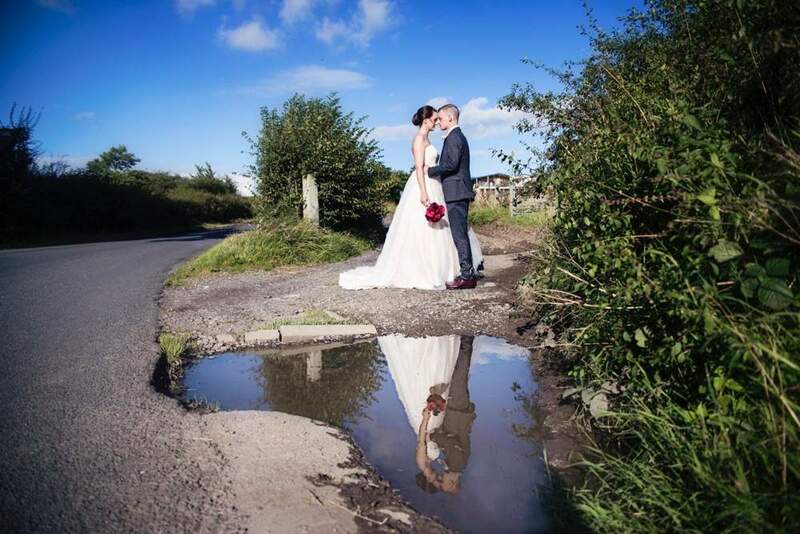 I wouldn’t hesitate to recommend Sylvia as she was professional throughout. 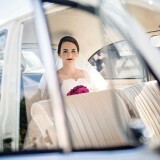 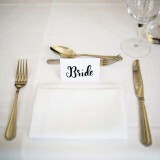 We had a number of calls prior to the wedding to ensure she knew exactly what we wanted. 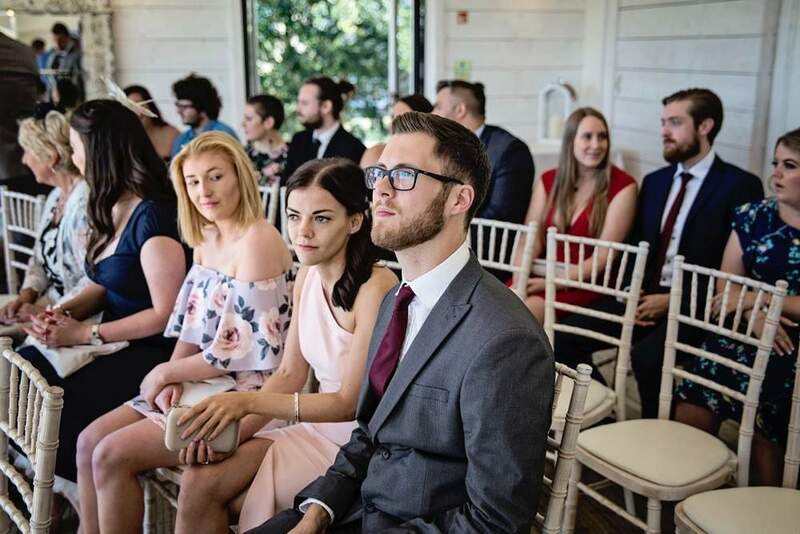 We were definitely not disappointed. 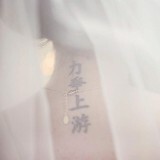 The photographs are beautiful. 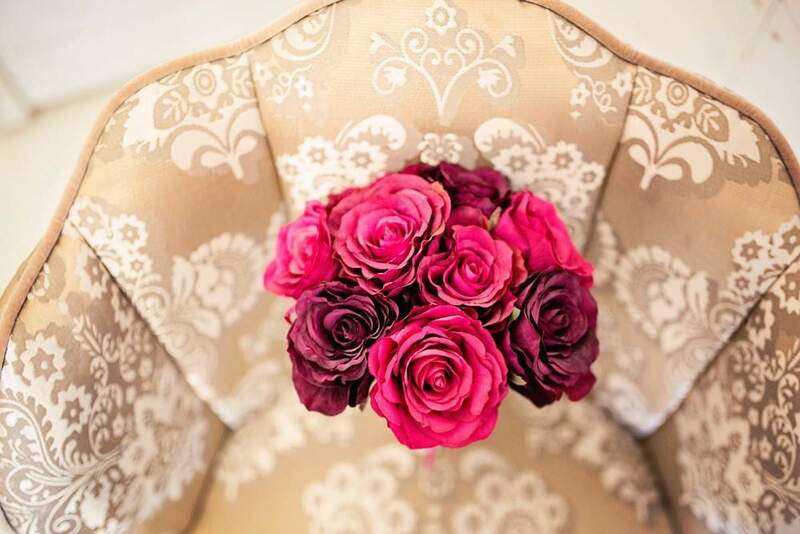 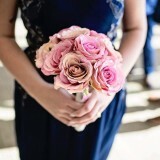 For my bouquet, I held artificial burgundy roses. 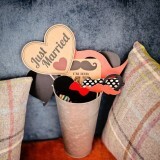 I bought the flowers from Country Baskets in Astley and then wrapped and added the Disney brooch myself. 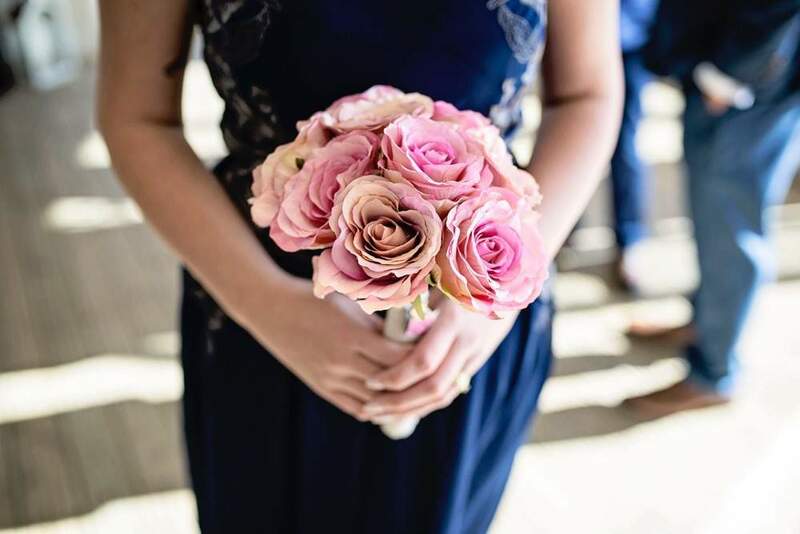 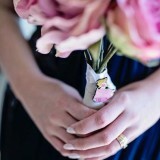 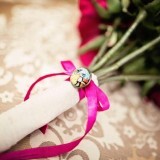 My maid of honour held dusky pink roses with a Sleeping Beauty pin. 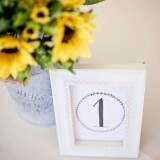 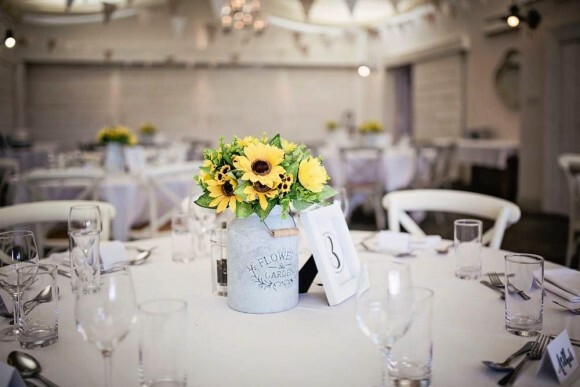 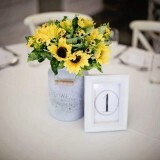 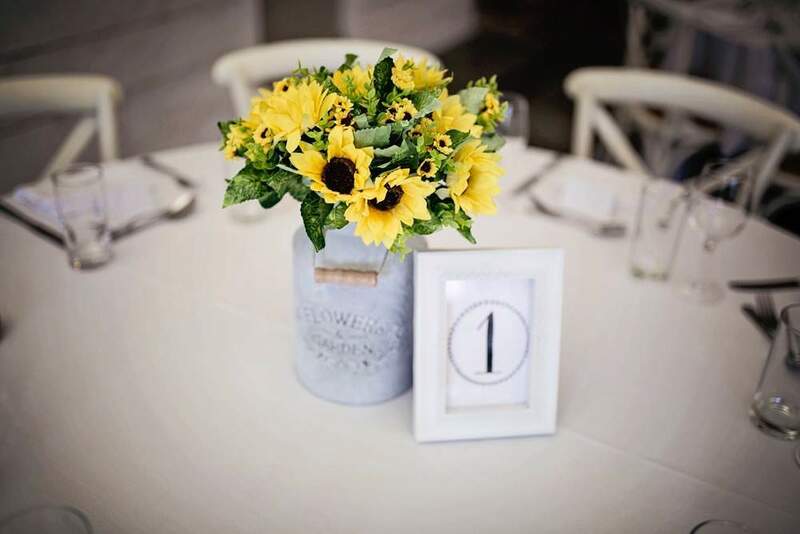 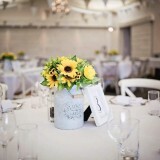 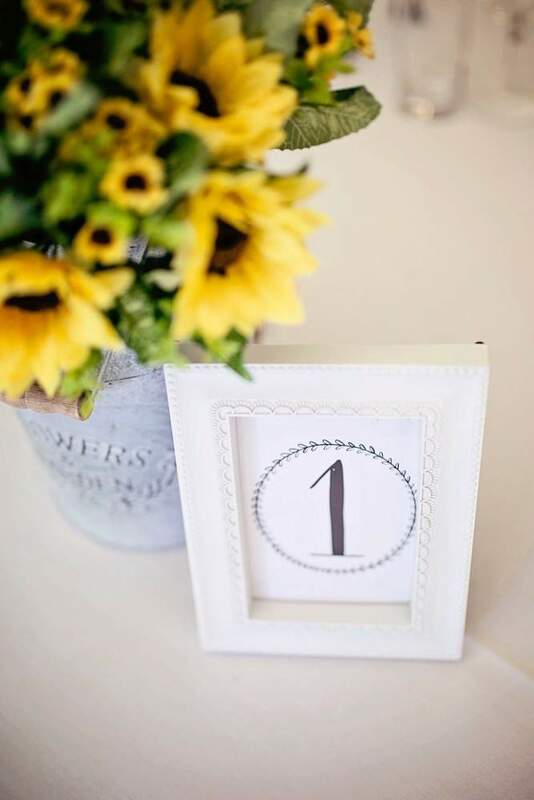 Our table centrepieces were small milk churns filled with sunflowers. 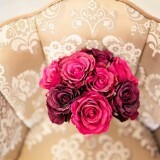 I spent hours unfolding the artificial flowers by hand but was pleased with how they turned out. 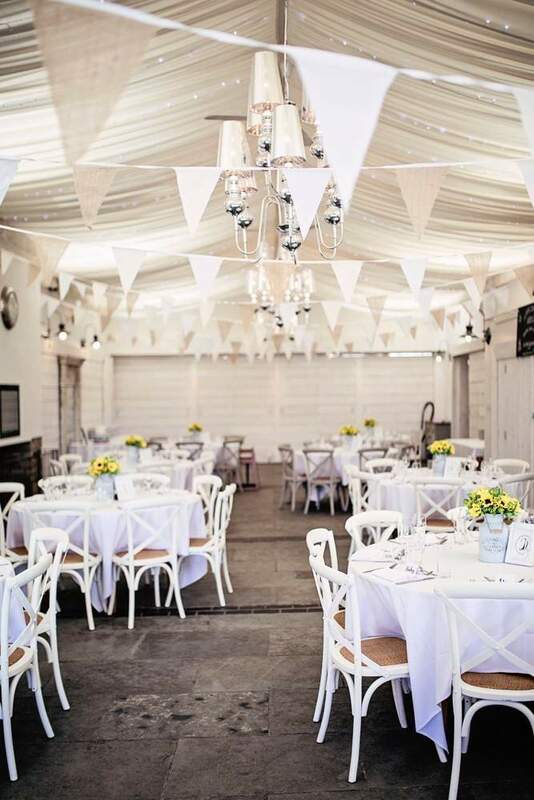 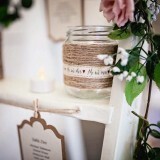 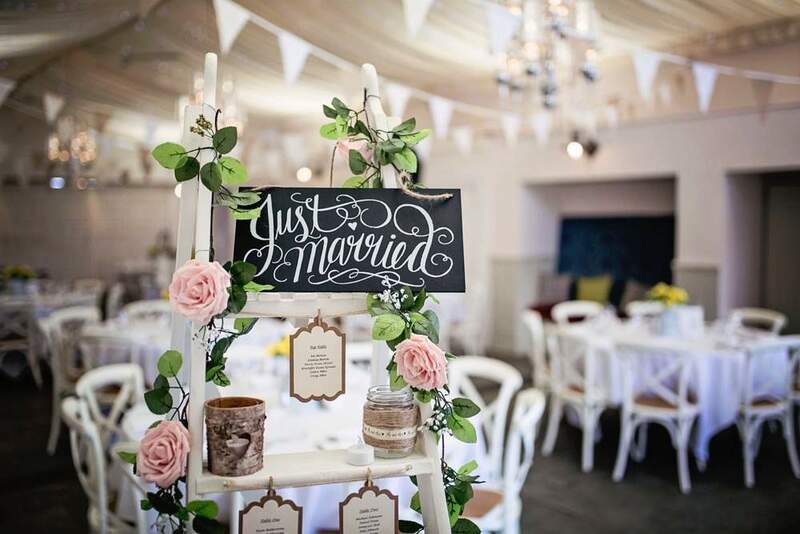 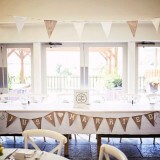 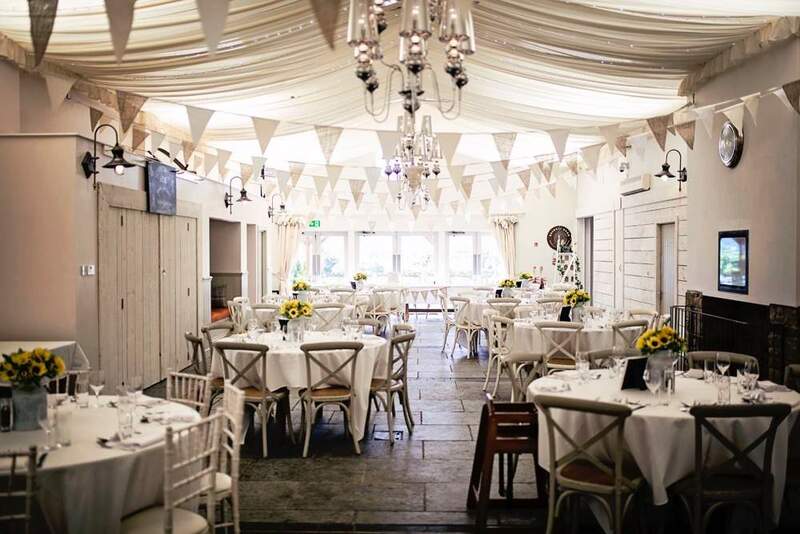 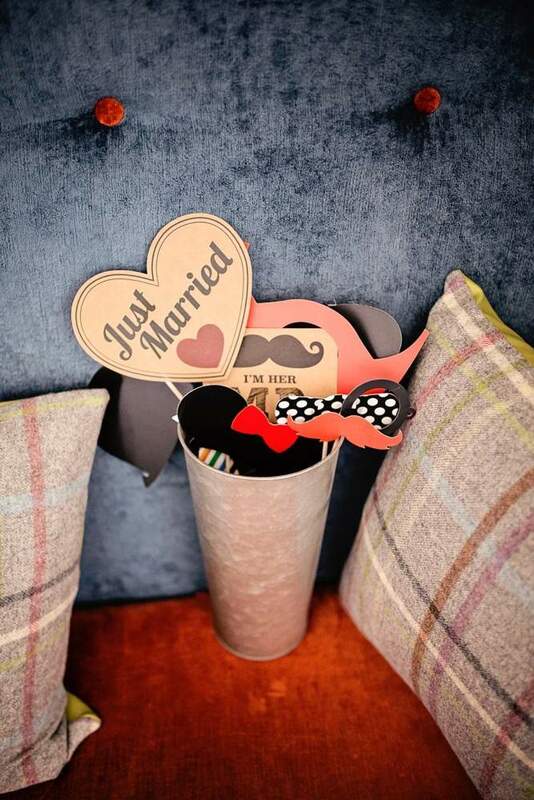 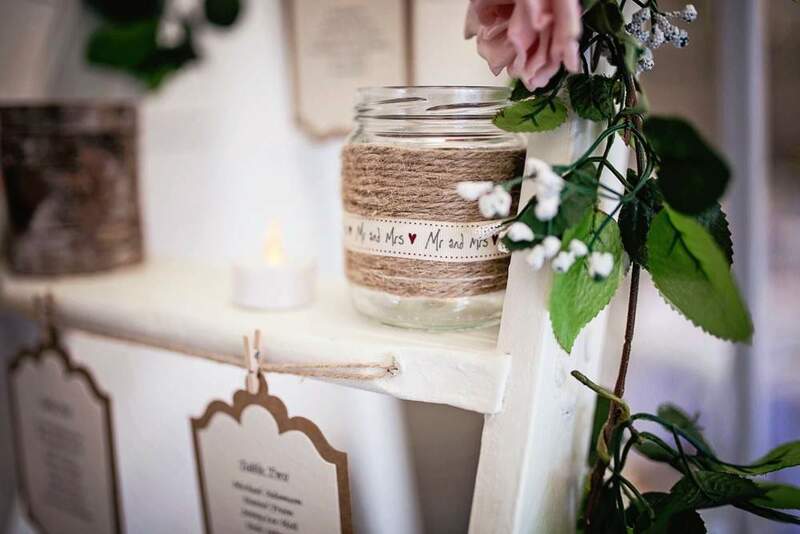 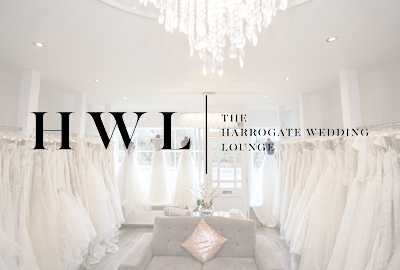 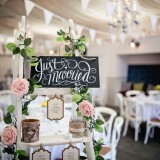 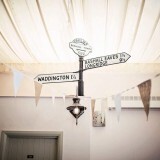 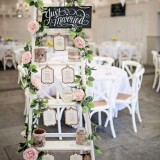 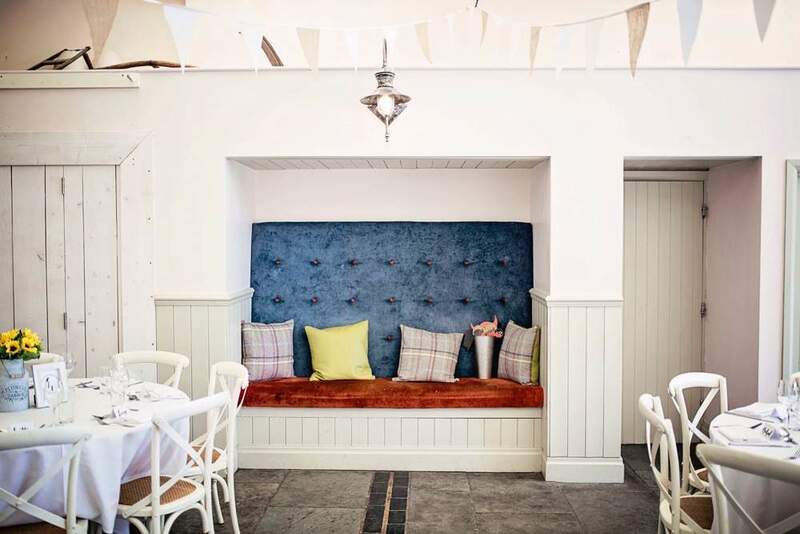 We also hired a ladder seating plan from Confetti and Lace, who are based in Lancaster. 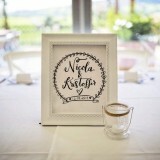 I had personalised name cards, table numbers and a wreath with our names, created by the talented Little Fox Creative. 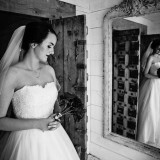 Jess was amazing throughout and really understood what I wanted. We had a beautiful two-tier Victoria sponge cake, with a map of the world on the bottom tier and the quote, “And so the adventure begins”. 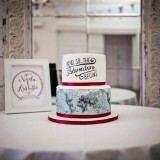 This was created by the very talented Tee Cakes from Golborne. 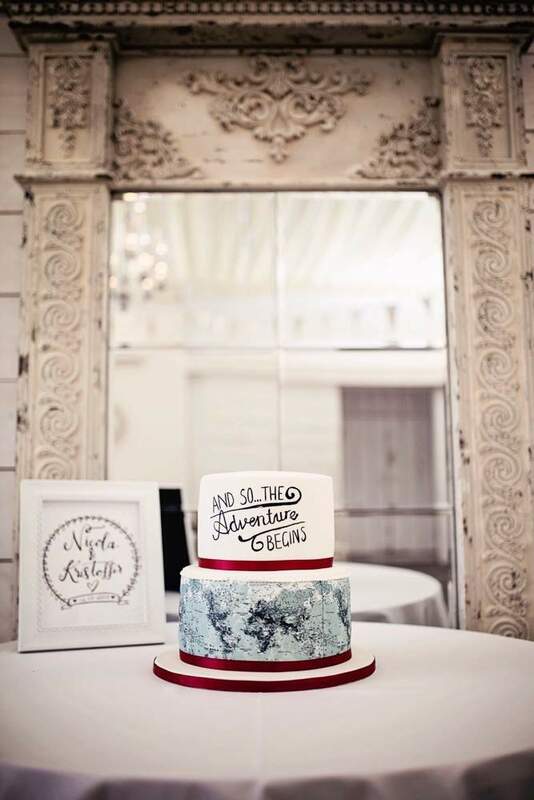 We just loved how unique the cake was. 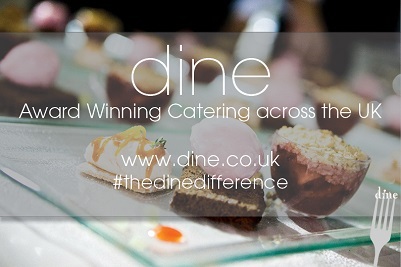 Food-wise, we had canapés of miniature Yorkshire puddings with beef, fish and chips, goat’s cheese tart and chicken satay, during the drinks reception. 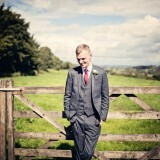 This was later followed by a hog roast with all the trimmings. 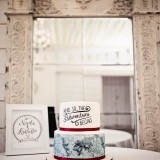 We also had a cake table which had six different types of cakes on it. 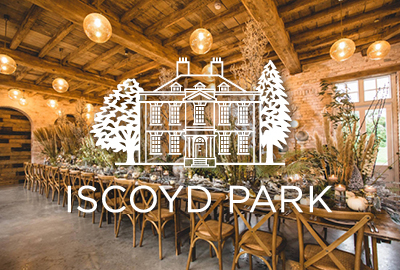 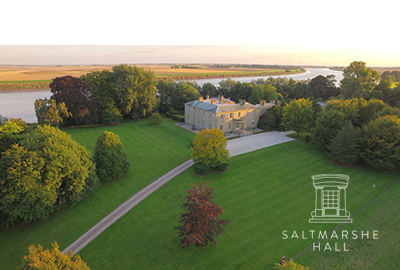 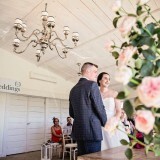 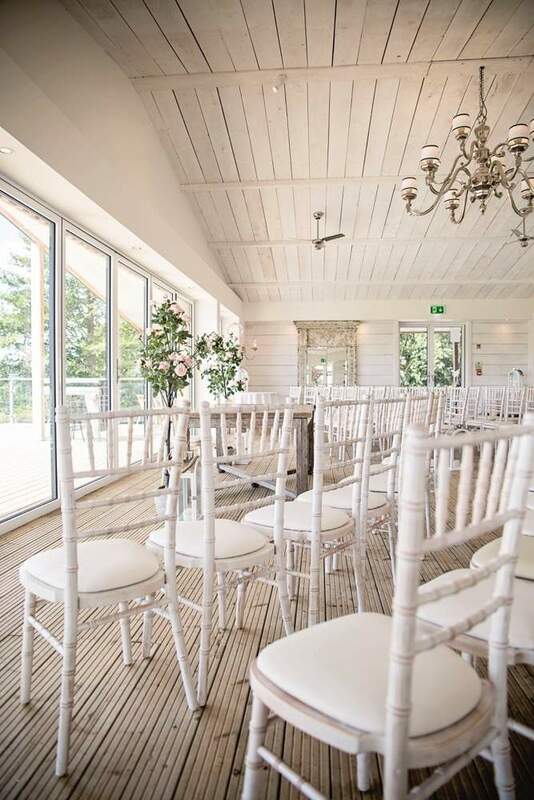 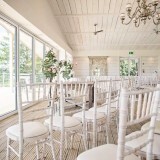 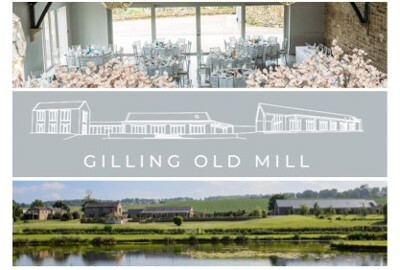 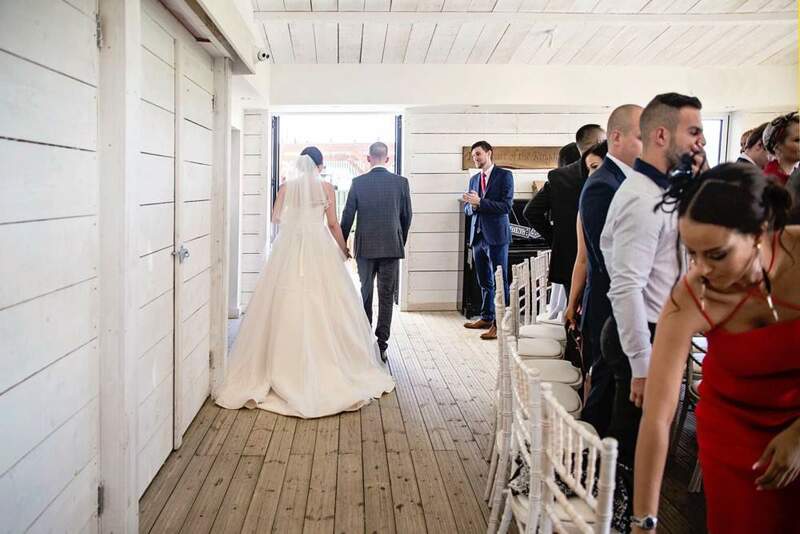 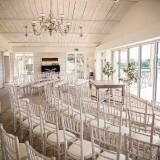 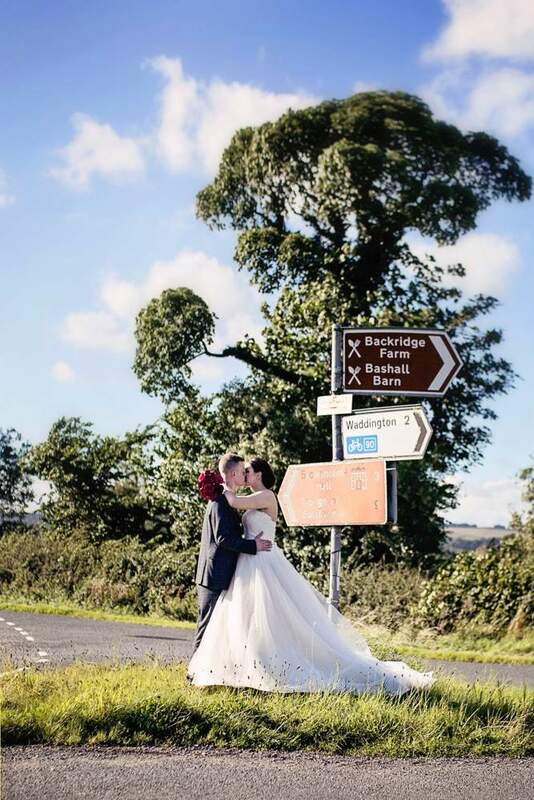 Following our wedding, we would recommend the venue 100 times over! 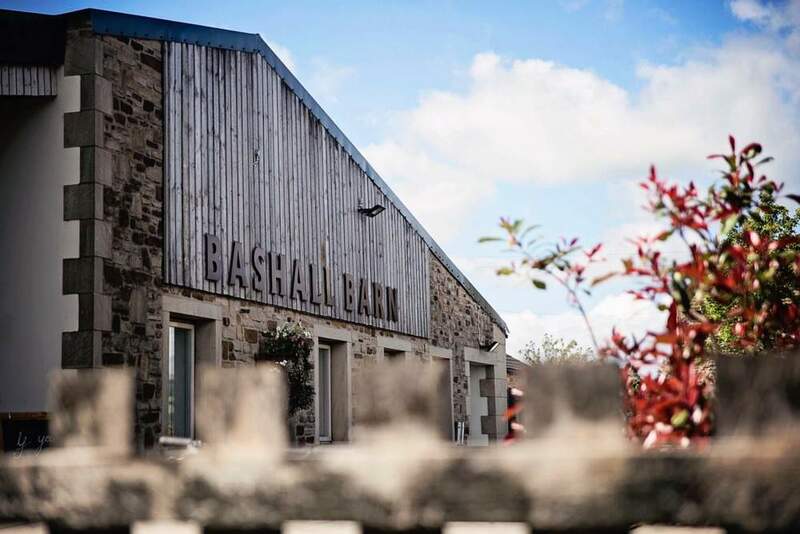 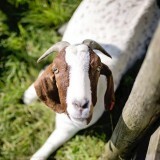 The staff at Bashall Barn were fantastic. 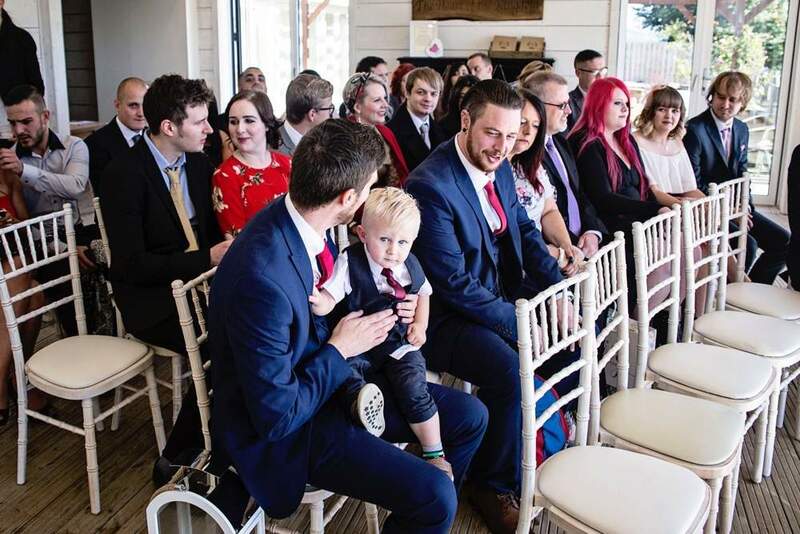 They ensured my nephew, who is one-year-old, was served his food earlier to avoid him getting hungry. 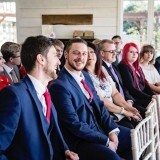 They joked and spoke with my guests and I’ve had lots of people saying how amazing the day was because of the staff. 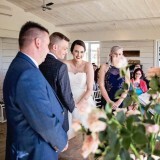 They also made sure everything ran to schedule. 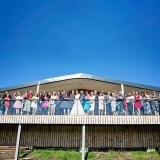 Then then there’s the views! 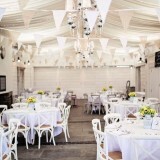 It’s the best venue I have ever seen. 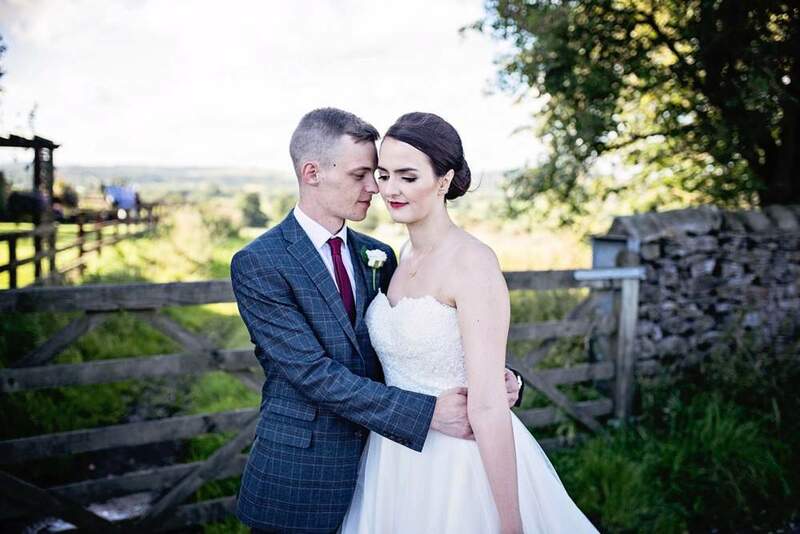 We were extremely lucky that the Perseid Meteor Shower fell on our wedding night, so that would have to be one of my favourite parts of the day. 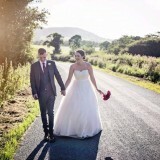 Kris and I sat outside talking about how amazing the day had been and watched shooting stars go by. 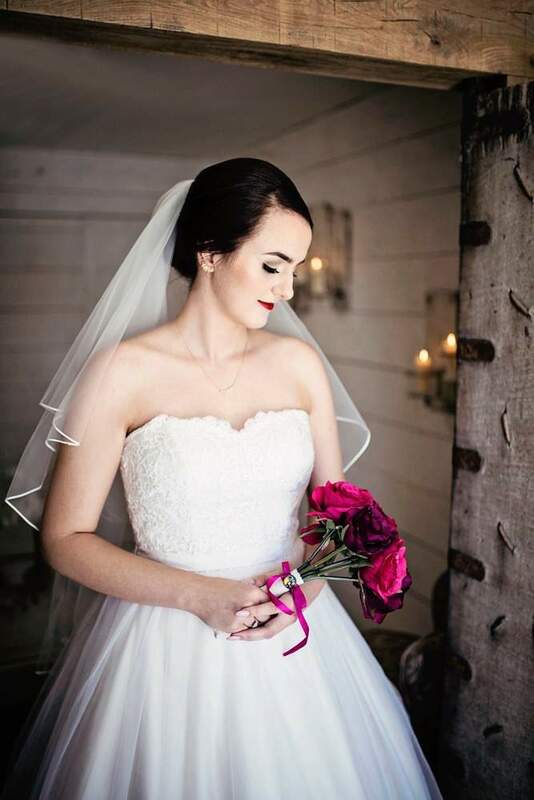 It was so magical. 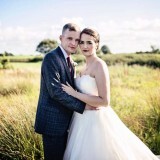 We haven’t been on our honeymoon yet but we will be going to Boa Vista, Cape Verde, in March 2018. 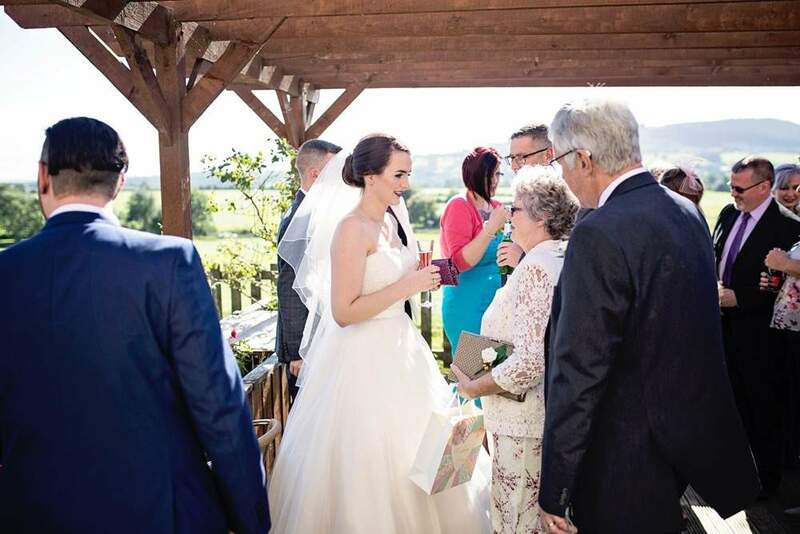 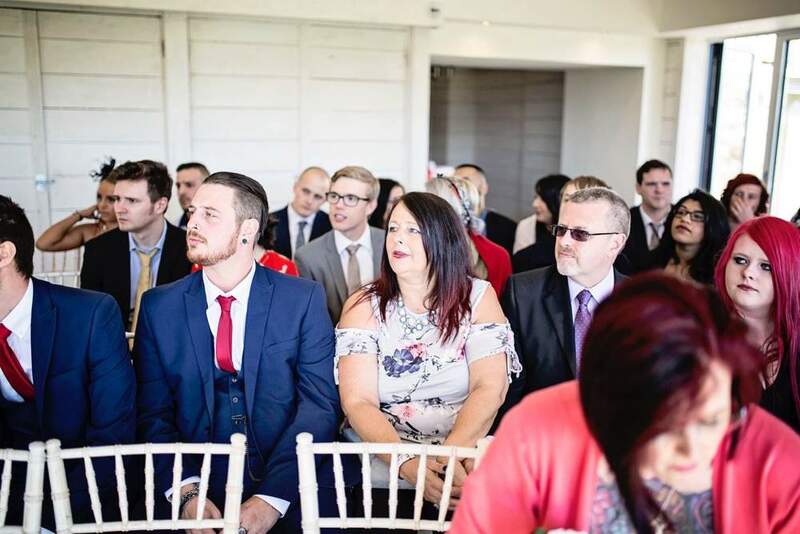 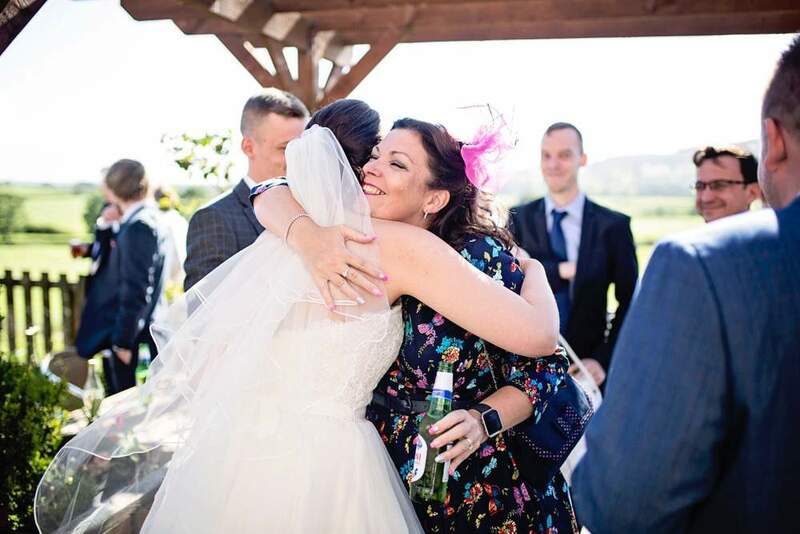 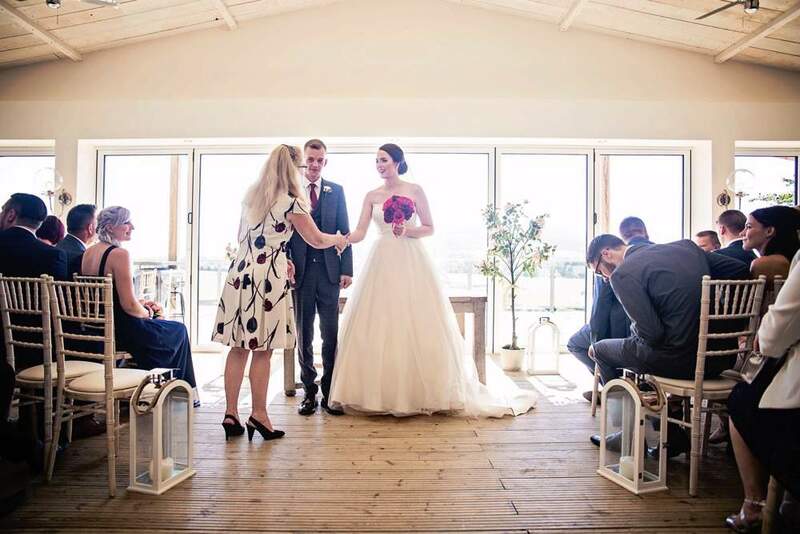 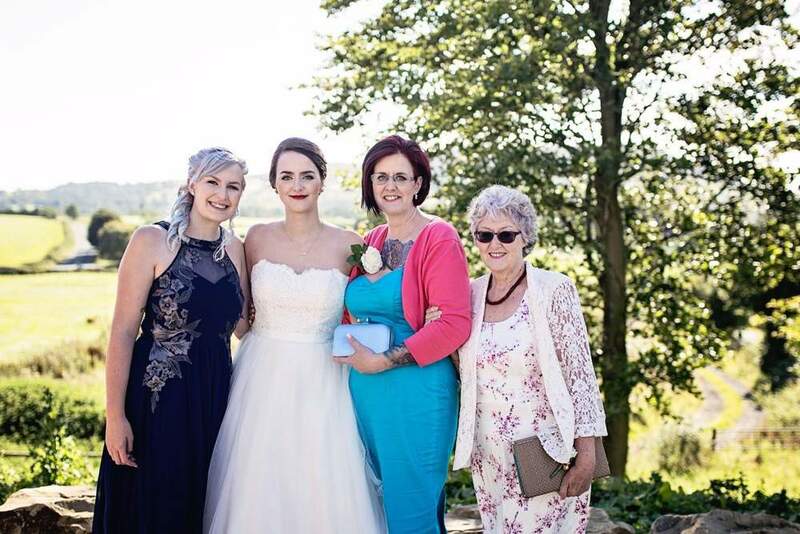 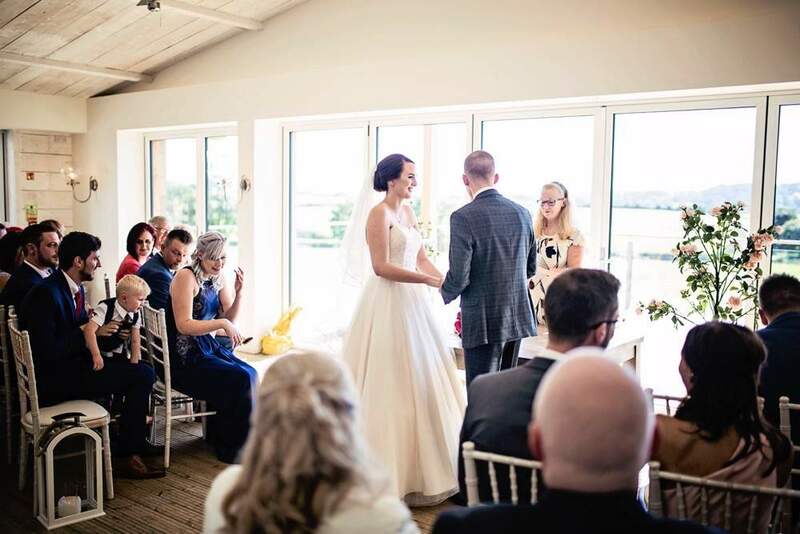 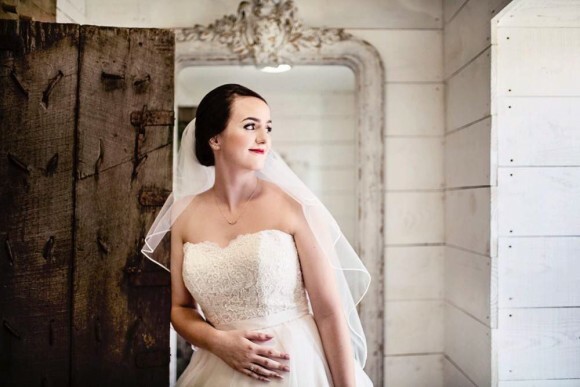 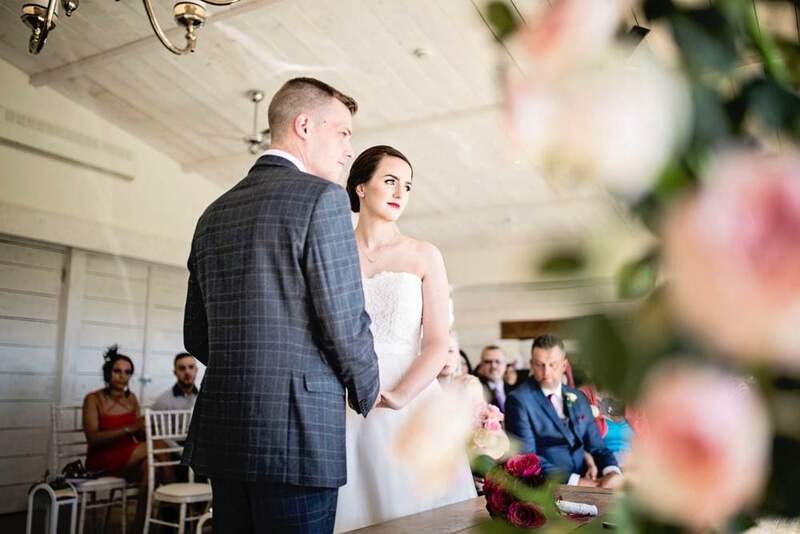 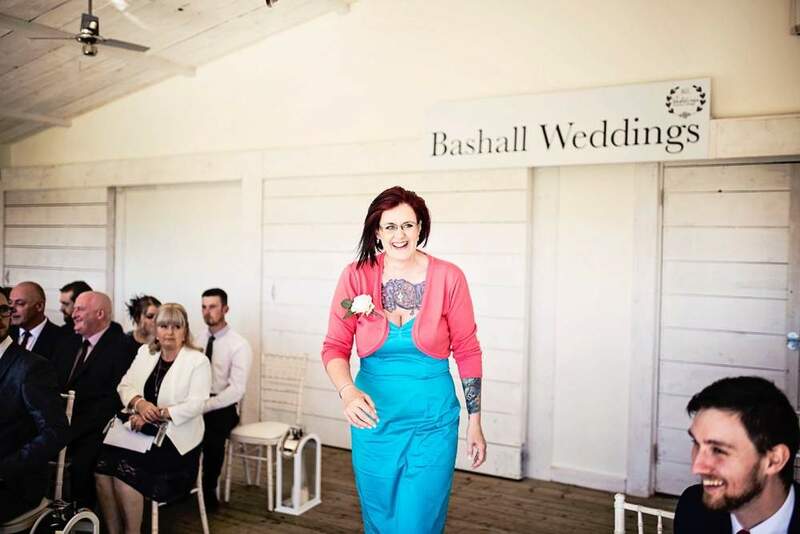 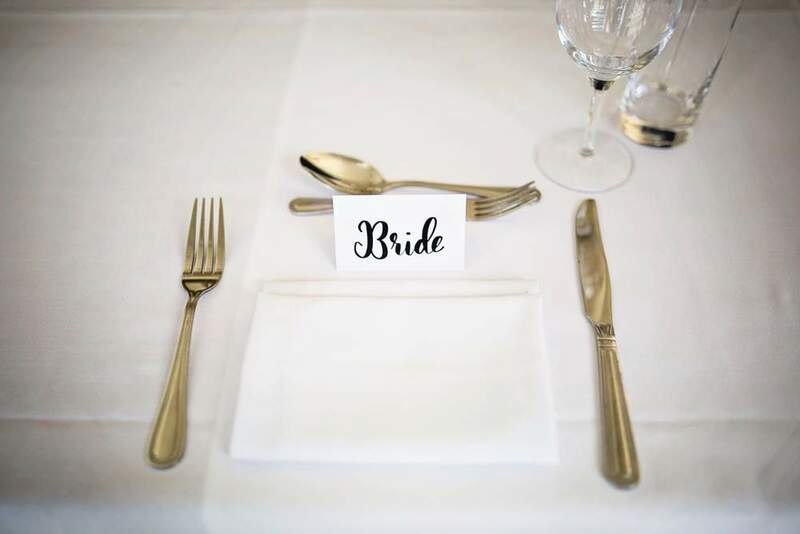 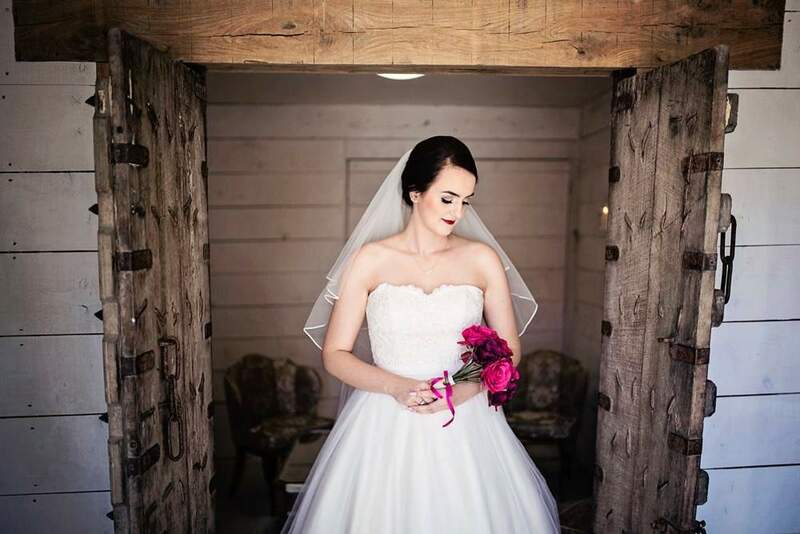 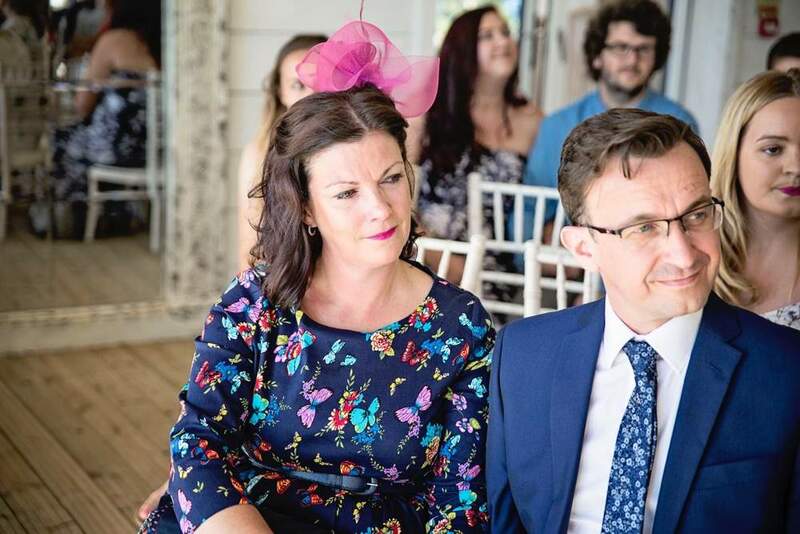 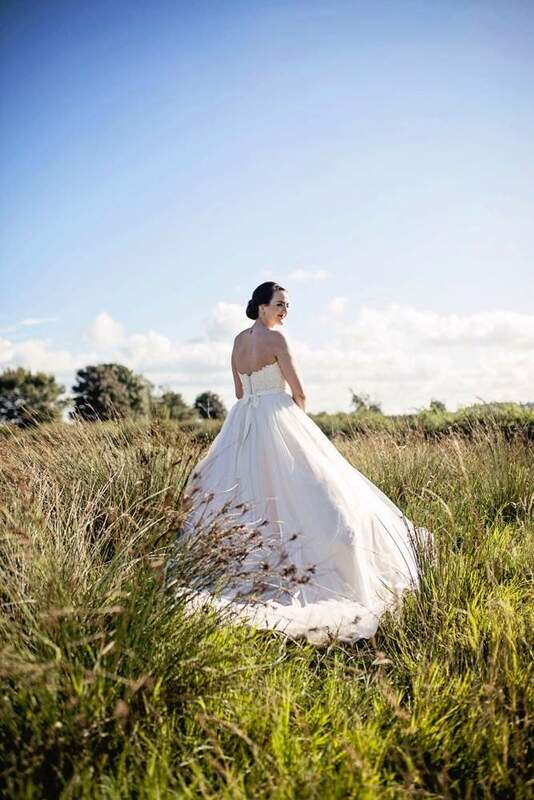 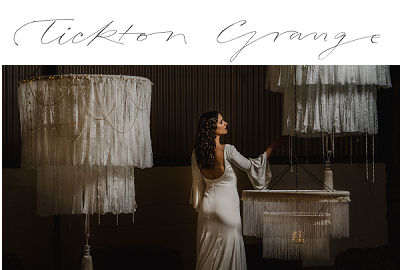 I was given one piece of advice, which really stuck with me through the day and which I would share with other Brides Up North: one thing is going to go wrong – when it does, just breathe and think that’s the thing that will go wrong. 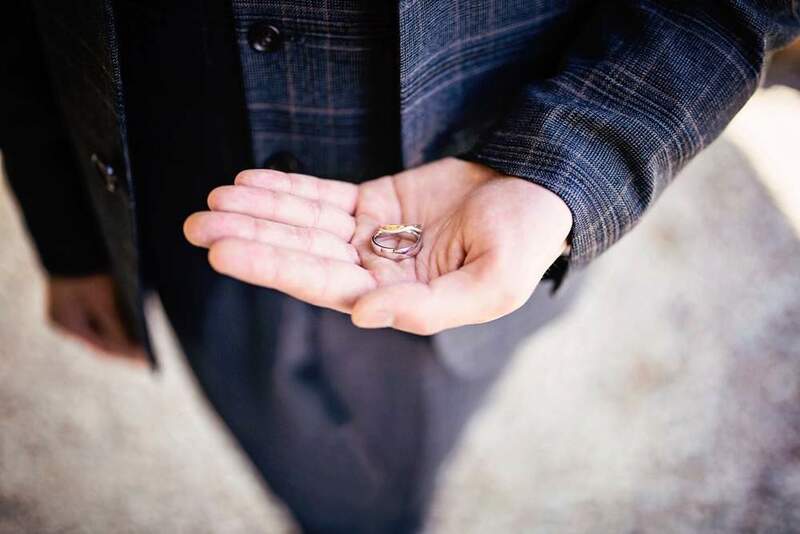 The main thing is that you marry the love of your life. 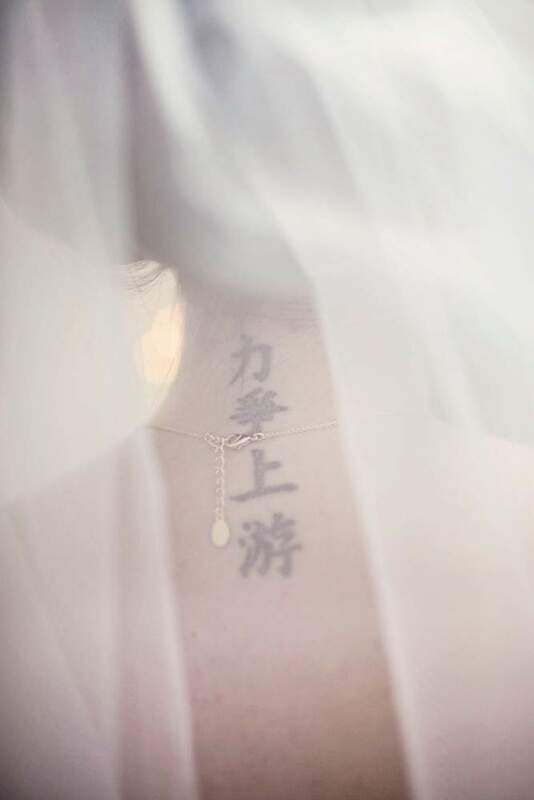 Nothing will matter more than that. 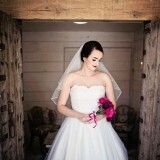 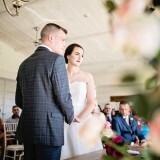 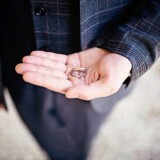 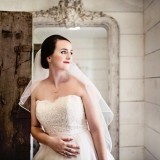 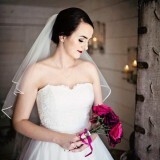 During the planning process, I loved reading the real weddings on Brides Up North. 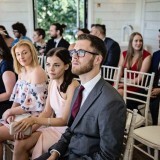 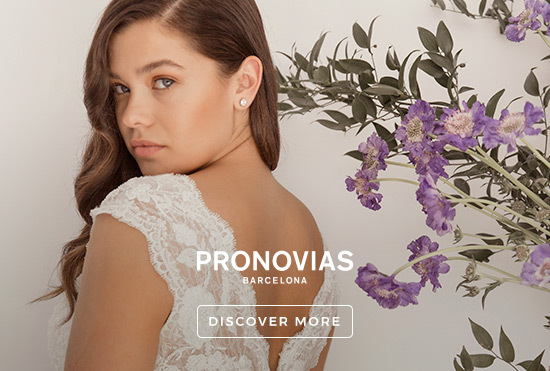 I really didn’t know where to start looking and came across the site. 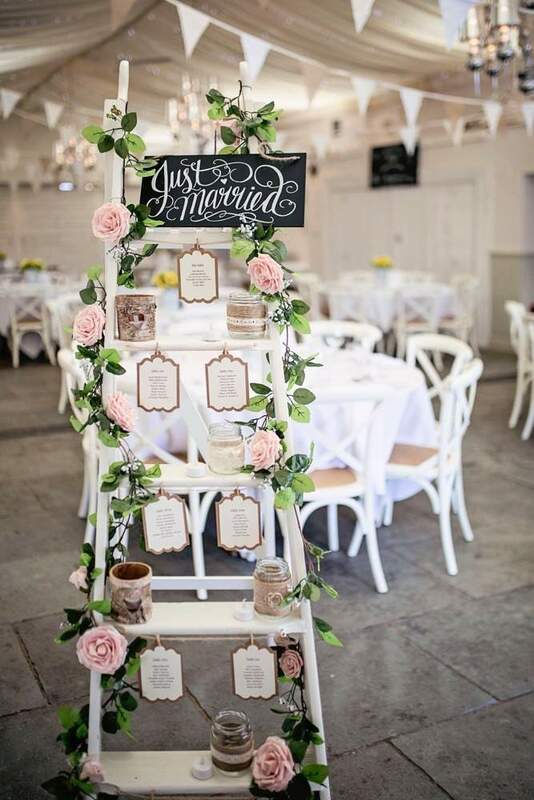 There are so many quirky and cool ideas that other people have had on their special day, so it provides great inspiration.